During our first year in London, we’ve spent a lot of our free time travelling around the city and exploring. It’s what we do. We pick a random place, or bus route, or underground line, and go there. 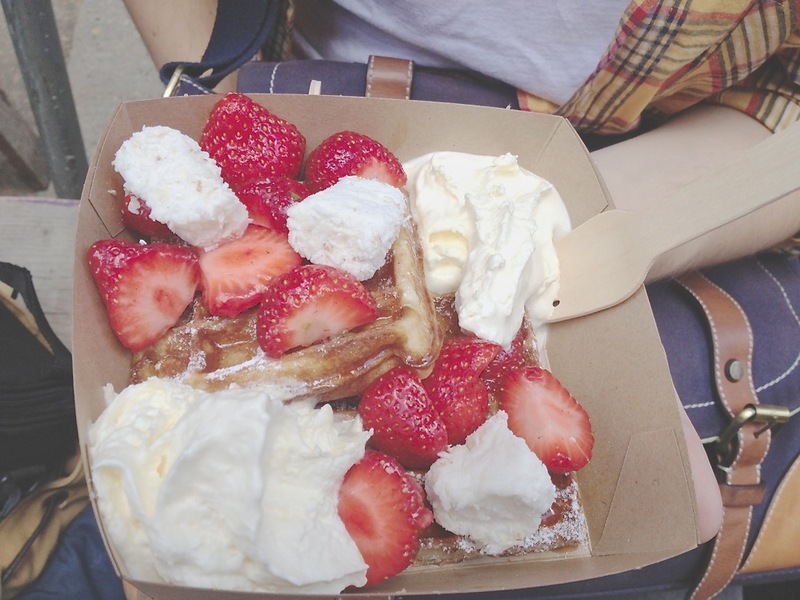 We love food markets, making a bee line for them in whatever city or town we end up in on holiday. 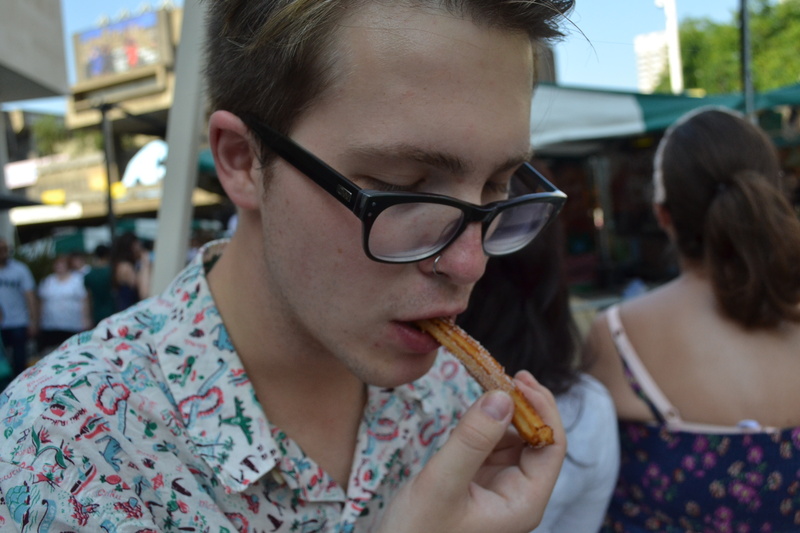 You can tell a lot about a city by looking at it’s markets and street food. It’s often quite reflective of the atmosphere or attitude of a city. Right now, there’s nowhere doing it better than our adopted hometown of London. 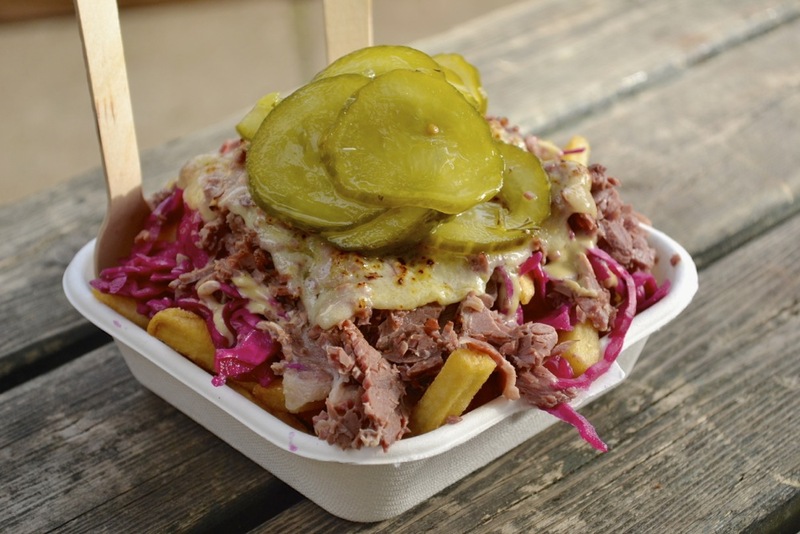 Whether you’re looking for some cheeky street food before a night out, stacking the kitchen full of organic produce for the week ahead, or looking for a taste sensation during a quick lunch break during the day, London is catering direct to the masses right now in a big way. There’s a heap of village-style and farmers markets popping up all over the city suburbs and there are hundreds to discover. Read on for our full guide to the best of the bunch in the city right now, in no particular order. 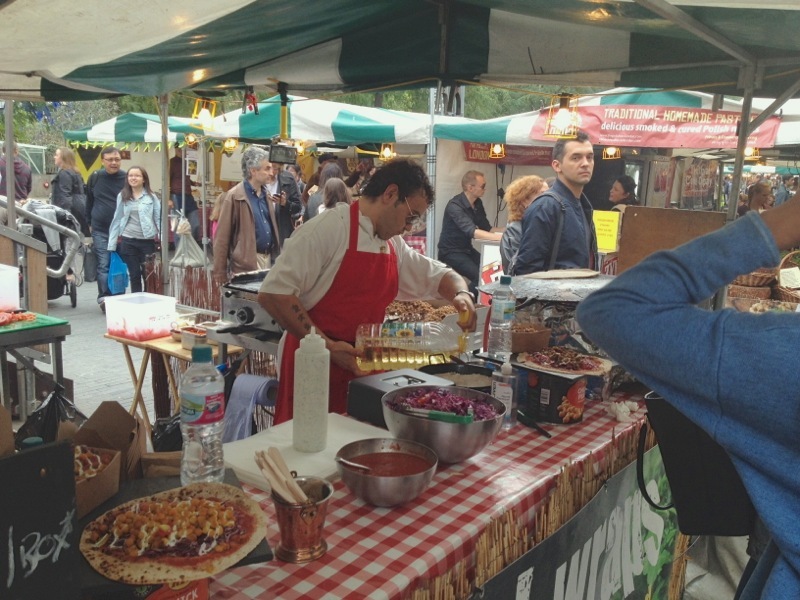 Launching in November 2014, Peckham Market is sure to be a great success. It takes place in a spacious school yard every Saturday from 10am-2pm. 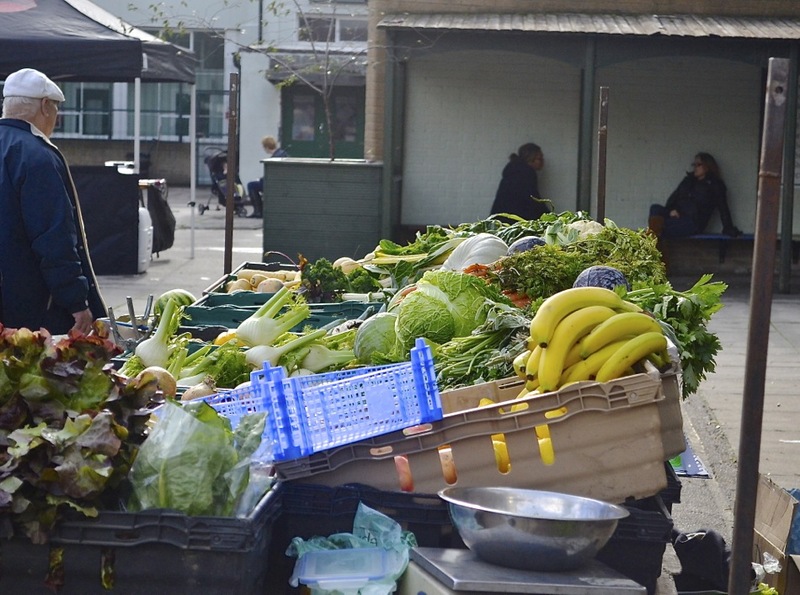 Since moving to SE15 back in June, we have been longing for a market just like this- a place nearby where we can get a bite to eat and a tonne of fresh produce and a few little treats to nibble on. 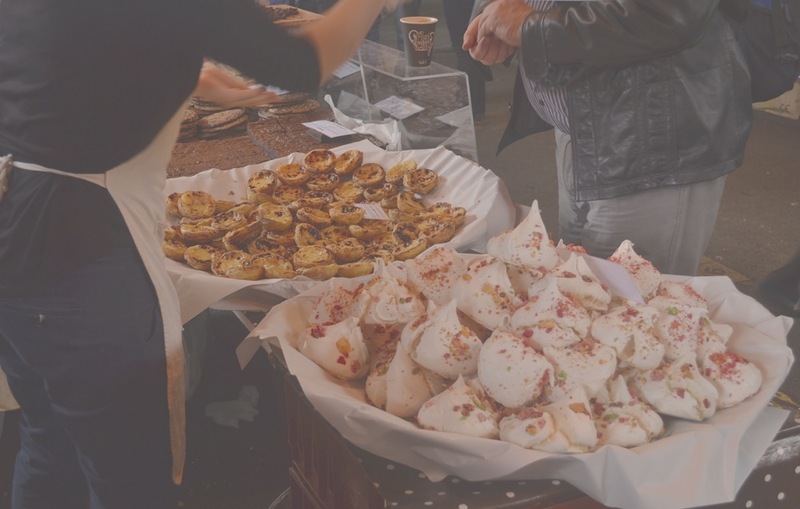 There is such a great variety of stalls here- including many familiar faces from Kooky Bakes to Finest Fayre, serving up the staples of a good market. So many tastes are catered for here- fresh, unique Italian pasta from Pastificio Mansi to burritos from the slick looking Club Mexicana. For kitchen essentials, there is such a vast array of fresh fruit and vegetables plus meat and fish. The amazing Flock & Herd from Belenden Road, Peckham are also there. 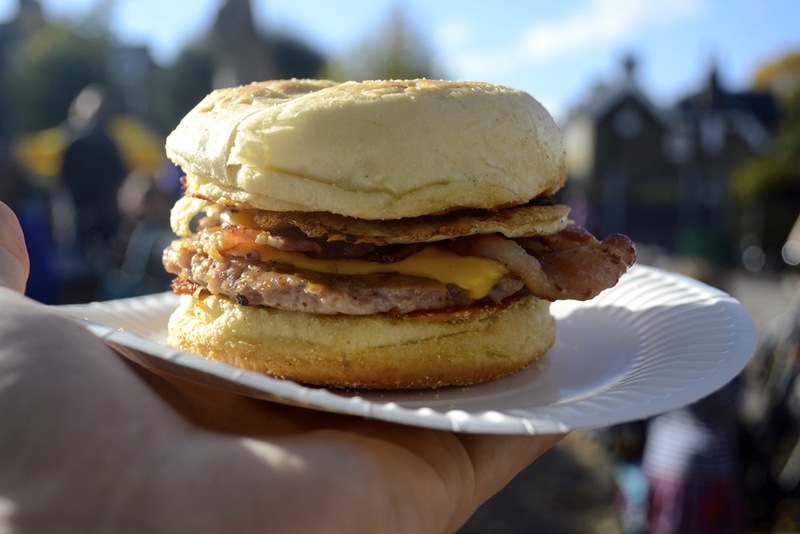 The standout highlight for us though is the Brekkie Muffin from Original Fry Up Material. 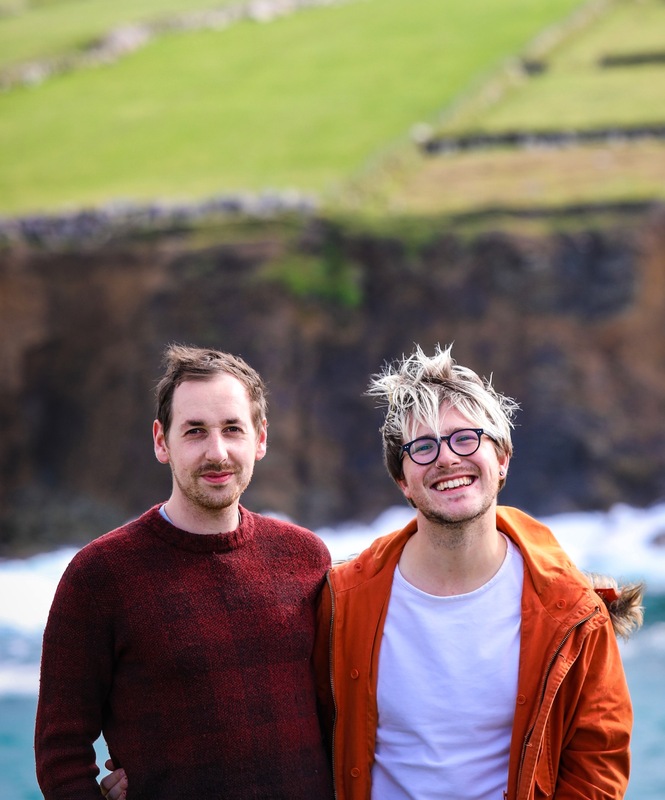 We first heard of them when we lived in Dublin on Mary Portas’s programme “Mary Queen of the High Street” and always miss them at whatever location they set themselves up at. But the almost 2 year wait to try them was totally worth it. 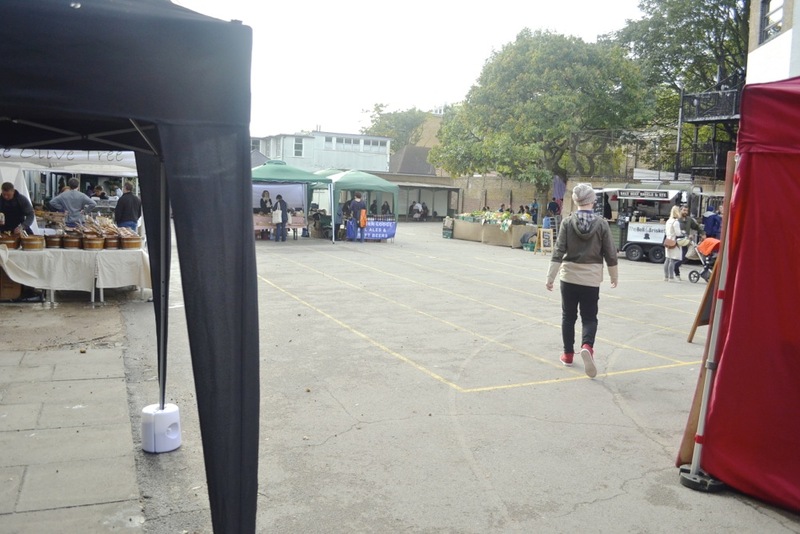 Peckham Market is located in the school yard at the back of Harris Academy Peckham. Numerous bus routes, including 12, 171, 343 and 345 stop outside at Stops S and Q (The Academy at Peckham). Also a ten-minute walk away from Peckham Rye station (Overground and National Rail from Blackfriars and London Bridge). 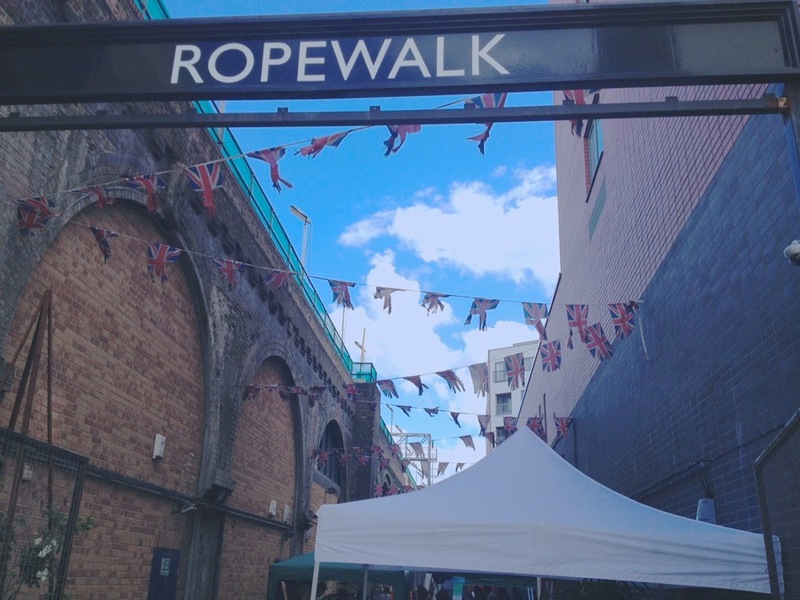 One of London’s newest and most exciting markets is Wapping Market. 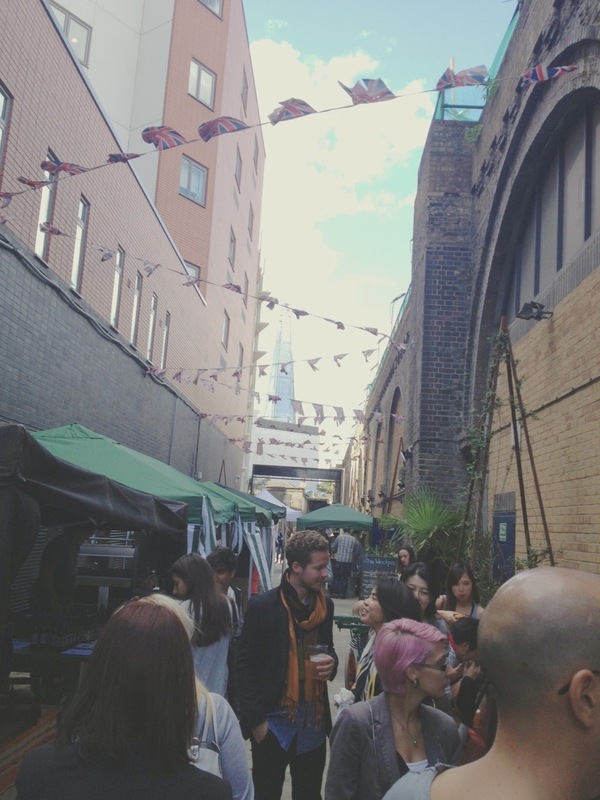 Curated and created by the same people behind Brockley Market (see below), this market takes place on a beautiful wharf in the Docklands. 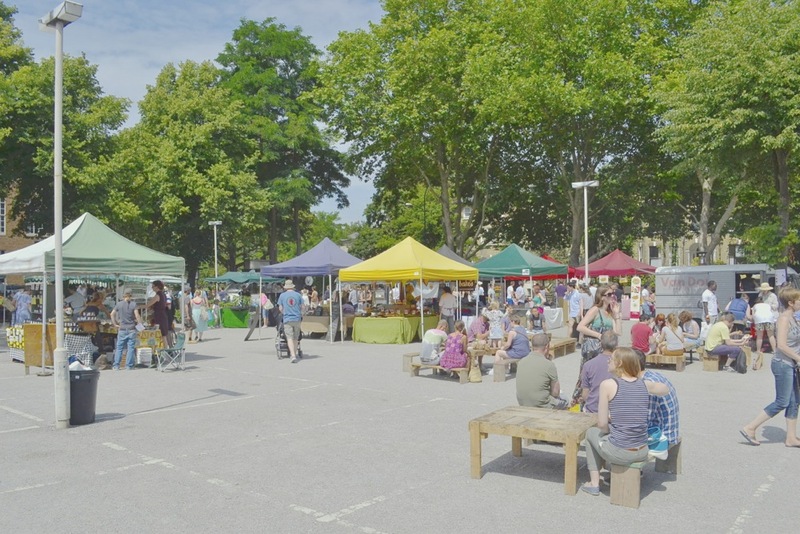 The market takes place every Sunday from 10am to 2pm and features street food favourites such as Mother Flipper, Crosstown Doughnuts and Van Dough as well as traders like Kooky Bakes, Cinnamon Tree Bakery, Perry Court Farm and Jacob’s Ladder Butchers. Brussels Wharf as a venue works, as there is plenty of walls which double up as seats. Wapping Market is located near Shadwell stations (DLR, Overground) and Wapping station (Overground), and requires a short walk. Alternatively, the D3 and 100 busses stop nearby. EDIT: Unfortunately, one of the newest market of the bunch seems to be indefinitely on hold. We will update when we hear their plans. 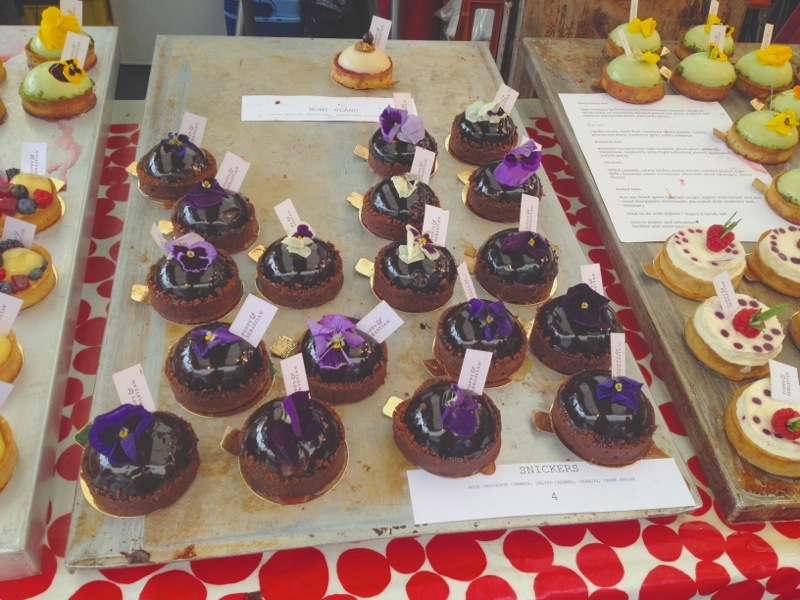 For now, here’s some pics of the traders and food from during the year up in Islington. 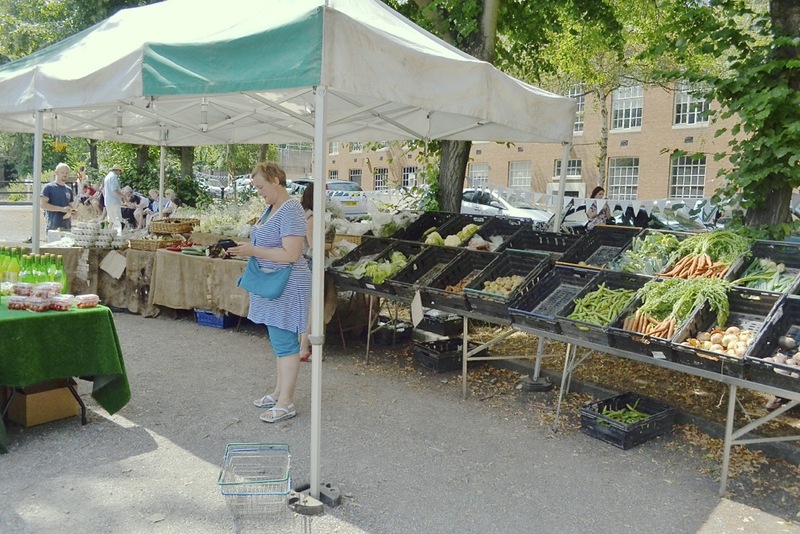 Sadly, after a dispute with the council and neighbours in the area, the market has had to close down for the bulk of the past six months, but will return triumphantly in early summer of 2014. Keep an eye out for all the info on their website here. 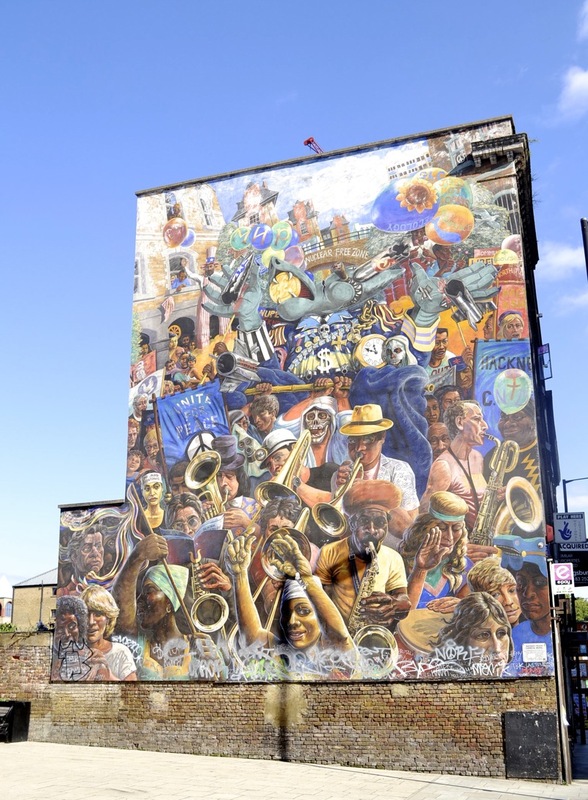 Peckham is well known to Londoners as a place where there’s many market traders along Rye Lane, as well as butchers and fishmongers lining the streets. Away from the hustle and bustle of it all on a Sunday morning is the Peckham Farmers Market. 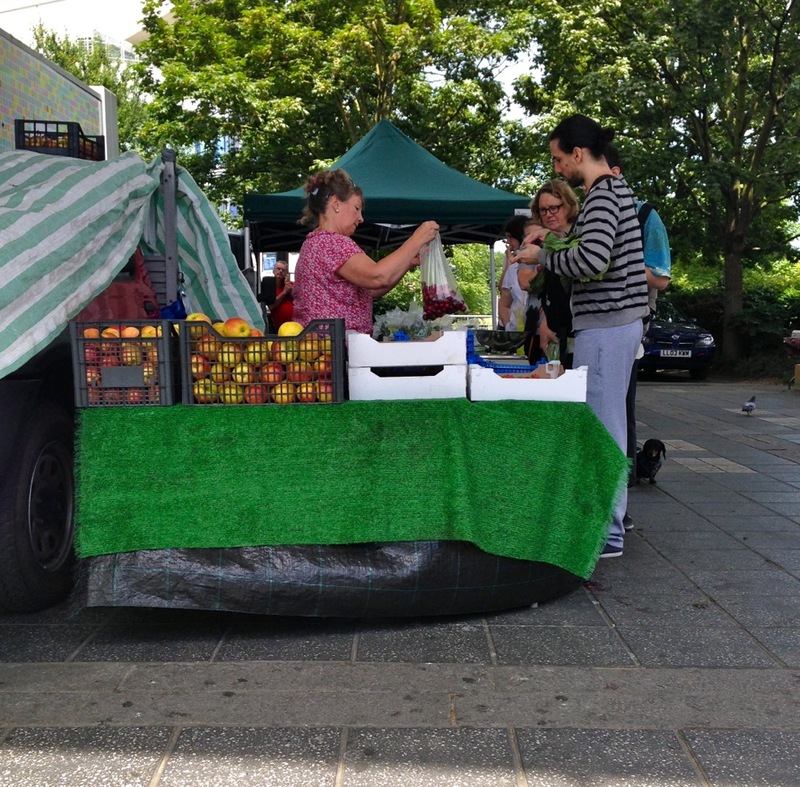 Taking place from 9am-1pm every Sunday, in the shadow of the iconic Peckham Library, you are bound to pick up a couple of fresh, seasonal ingredients to use during the week. 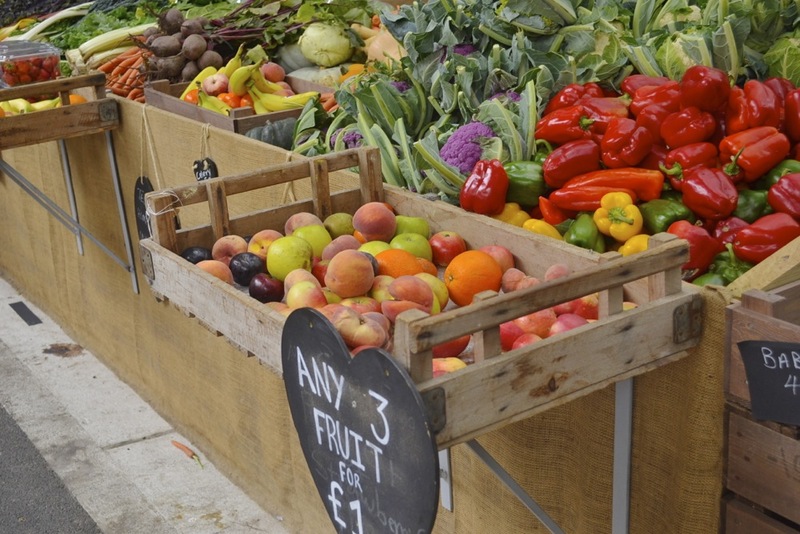 Expect to see fruit, vegetables, cakes, breads, plants and meat for sale at this market. 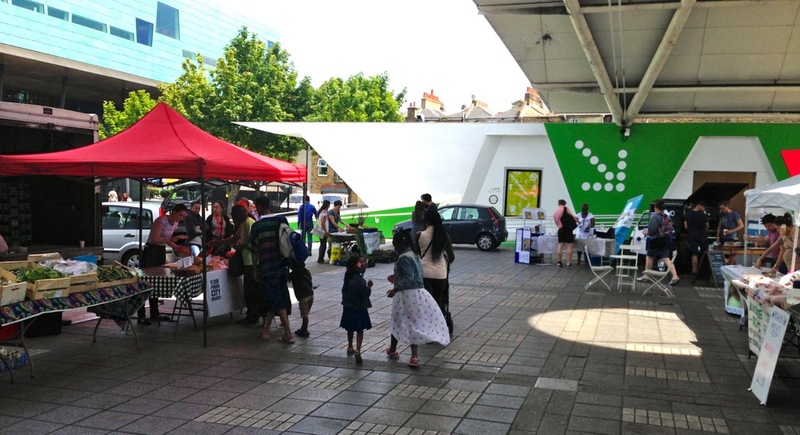 Peckham Farmers Market is easily reached by a number of bus routes 12, 36, 37, 171, 345 which stop right beside the market. Peckham Rye train station is served by Southeastern trains from Victoria, Southern Trains from London Bridge, First Capital Connect trains from Blackfriars/Elephant & Castle as well as Overground. 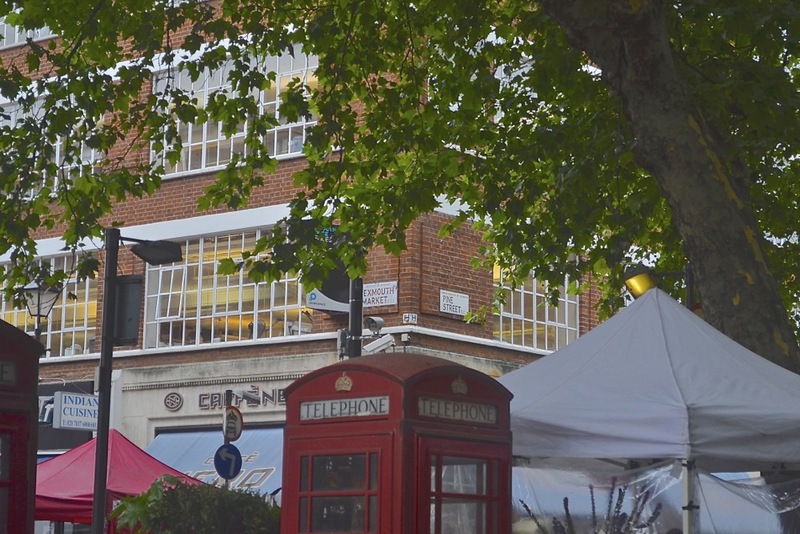 Exmouth Market is located in the heart of Clerkenwell, sitting directly between the Angel (Northern) and Farringdon (Hammersmith, Circle, Met) tube stations. The street is cobbled and cute, with some design shops and lots of restaurants, delis and cafés dotted either side of a pedestrianised promenade. 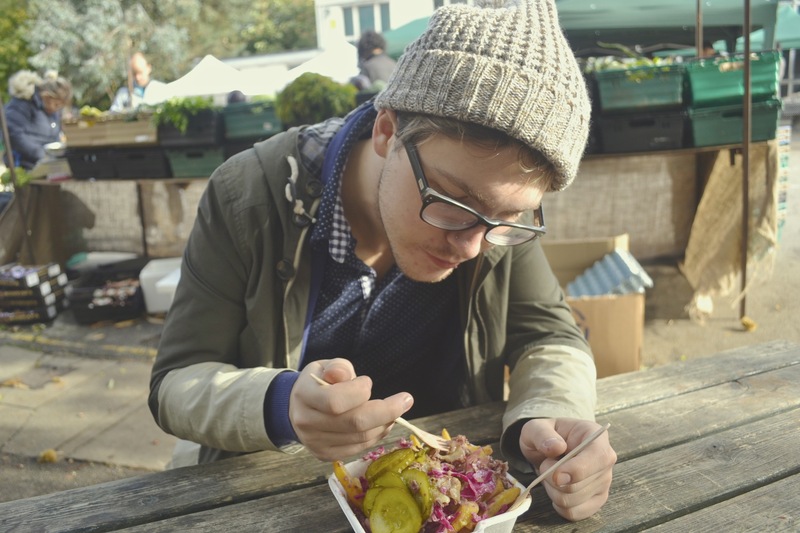 There’s a nice balance of street food traders and static businesses during weekday lunchtime, giving visitors a broad choice on any day they stop by. 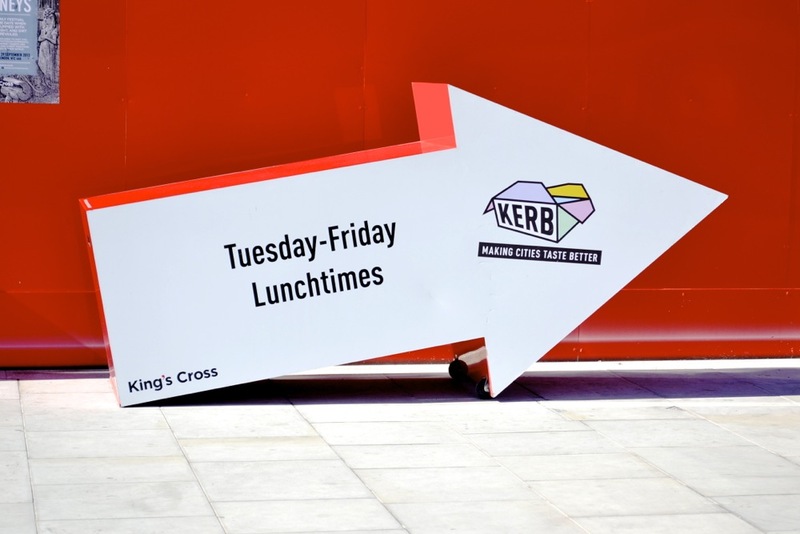 During the week, it has quite a ‘working lunch’ atmosphere throughout the lunchtime/afternoon as nearby office workers pop by their favourite places for a quite bit to eat. The lunchtime stalls usually run from 12pm to 3pm, Monday to Friday. On weekend nights the bars are buzzing and it’s often hard to get a table at the popular restaurants open from dinner ’til late. Worthy of a visit to both stroll by and sample street food, as well as knocking into one or two or the bijou restaurants in the evening time. There’s a wide variety of international nosh on offer all along Exmouth. This cute little gem is hidden up in Harringay and set within a primary school’s yard with a playground attached. You can get to it by using either the National Rail and get off at Harringay station or use the Overground and hop off at Harringay Green Lines. Either way, it’s about a five minute walk from either, the market is situated on Mattison Road. One of the newest markets on the London scene. Though it’s only open on Sundays from 10am until 3pm. There’s usually 10-20 stalls, and it’s where we tried one of the best grilled cheese sandwiches we’ve ever had (GrillMyCheese), some Caribbean Guinness punch and goat curry (TheIslandGrills) and cronuts/crodos! Well worth a visit, if even just to grab some coffee and a late morning snack to read the papers with, it’s a truly gorgeous setting. 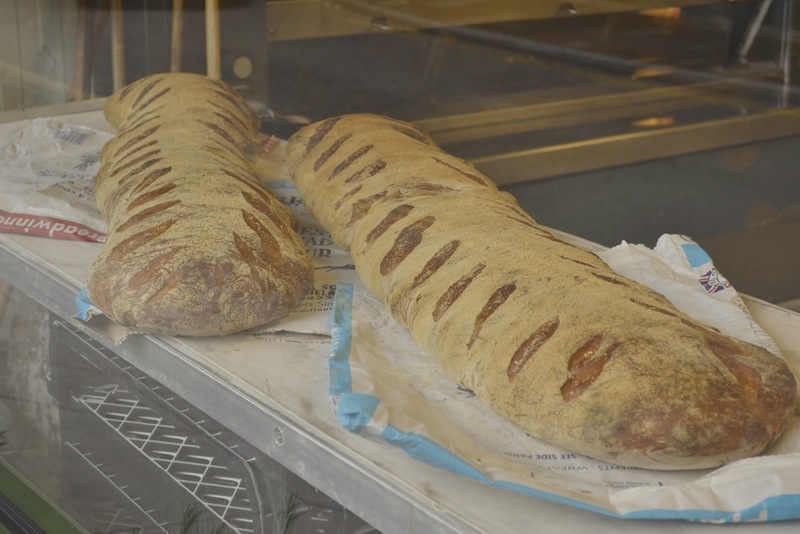 A real community feel and artisan produce, there’s information on their website about their story and traders: http://harringaymarket.co.uk/. Follow them on Twitter too for updates. 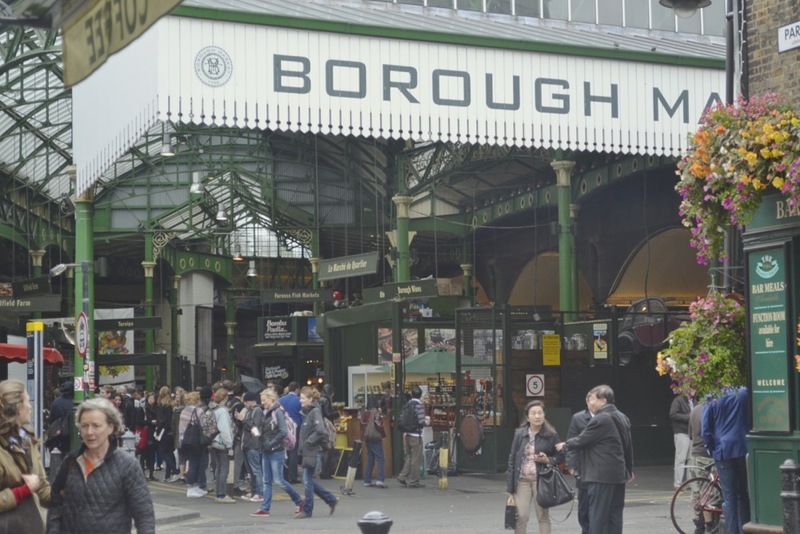 The most obvious and celebrated of the London food markets, which is a bona fide tourist attraction in it’s own right. It’s even brought Ina Garten, a GastroGays goddess, in for a peek! 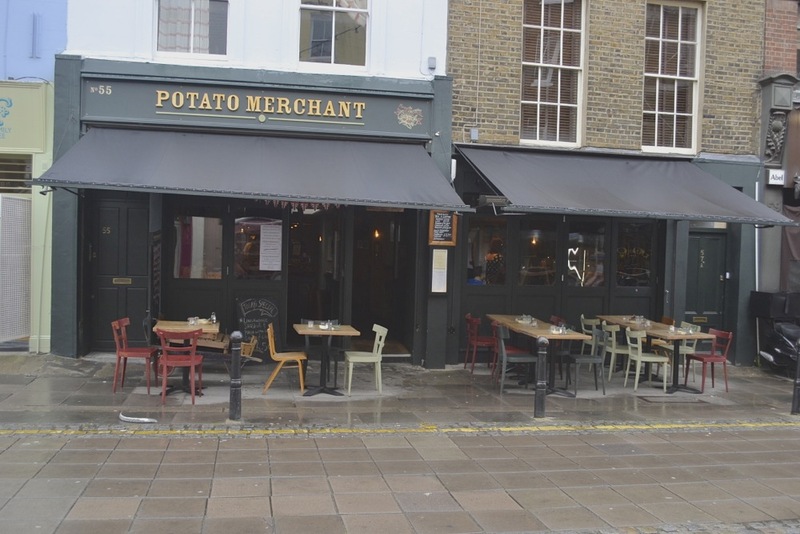 It’s celebrated and expensive with the best of produce, but also has a whole host of cheap street food on offer too and ample brand new seating at the front. 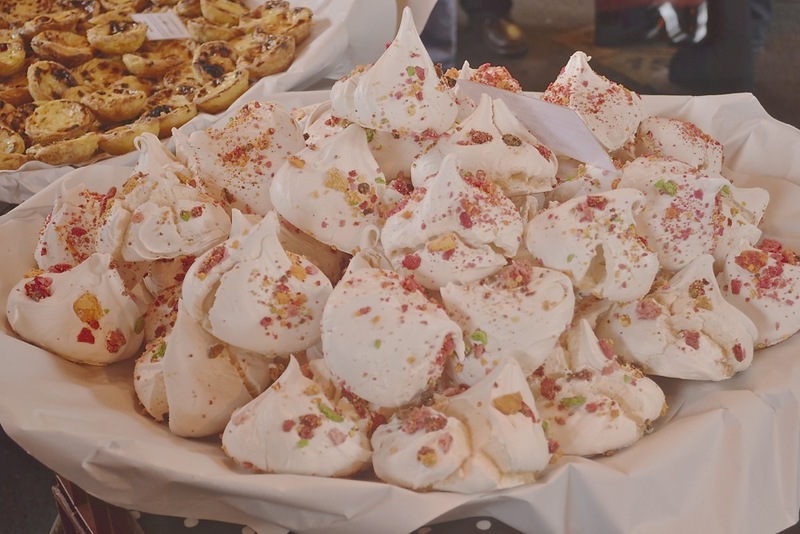 Theres cakes, an entire fish section, a cured meats section, lots of fresh fruit and vegetables, as well as endless amounts of artisan produce businesses with stalls. The market is right beside the London Bridge underground/rail station (Jubilee, Northern). Top tip, if getting off at London Bridge, exit the station from the Northern Line side of the station, as from the Jubilee you have to walk all around the block to get to the market. If you can’t find it at Borough Market, it’s gonna be tough to find anywhere else as almost everything is catered for here. There’s some great specialist stuff, like a dedicated Croatian cuisine shop, game and exotic meats butchers, vegetarian paté and a wheatgrass juice stand. The market also carries everyday food essentials too. The market is split into about four different sections in different semi open-air buildings. 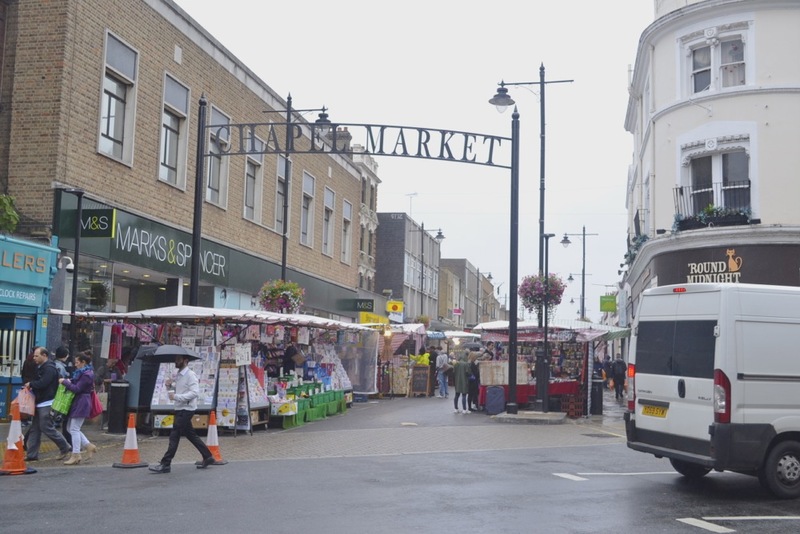 The traders are feisty and some of the best in London, with many taking pride of their stall or shop and creating eye-catching frontage and displays. There’s lots of free samples on offer too. While in the area, you must check out Monmouth for the best cup of coffee in London and the Neal’s Yard cheese chop, both located on the outskirts of the market. On Thursday the market is open 11-4pm, on Friday it’s 12-6pm and Saturday, the busiest day, the market satisfies customers from 8am until 5pm. It can get quite packed and there is always lots of eager tourists, so best to avoid around lunctime on a Saturday if you prefer a quiet browse. 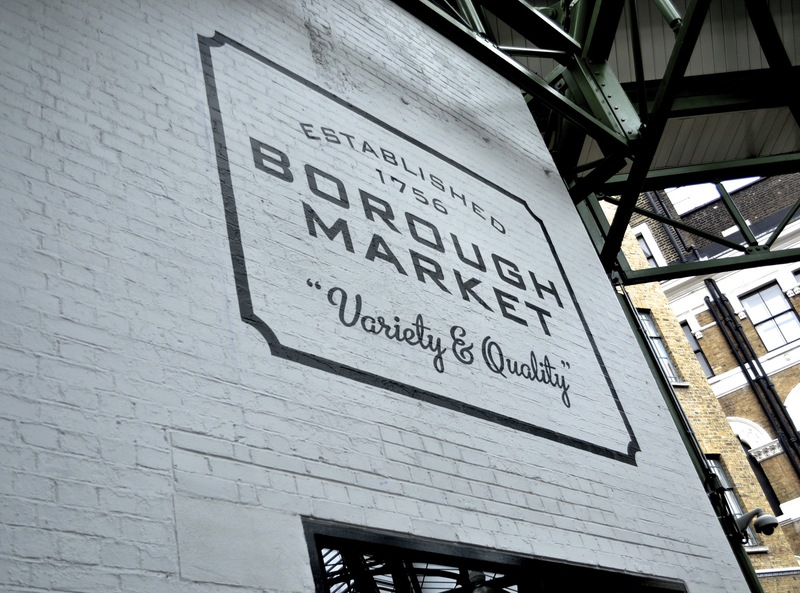 Check them out on Twitter or visit the website: www.boroughmarket.org.uk. 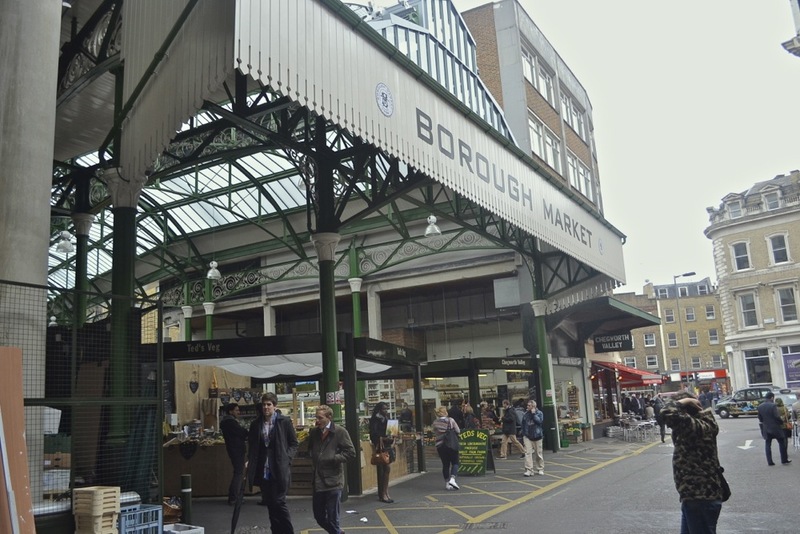 This is one of our favourites and one of the first markets we visited when we moved to London. Broadway market is well worth a trip up to Hackney on a Saturday or Sunday afternoon, especially when the weather is warm. 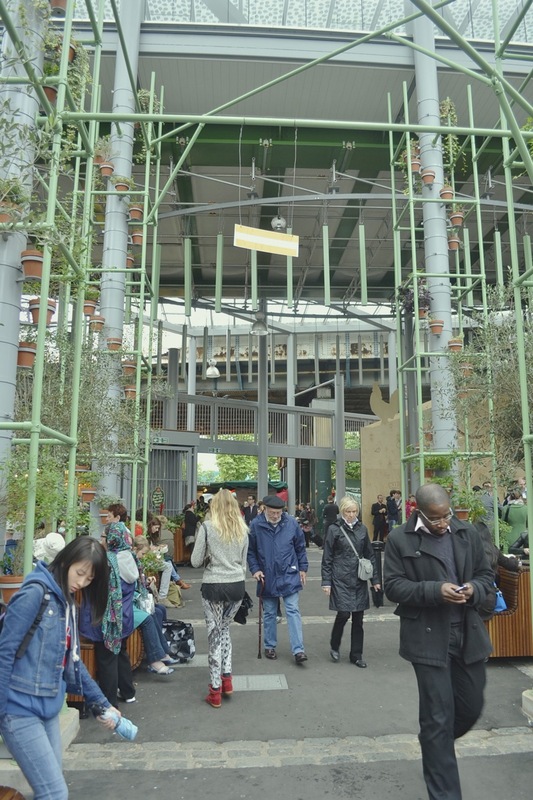 It’s best accessible by National Rail and getting off at either Cambridge Heath or London Fields station, we prefer the latter as you then get to stroll through the gorgeous Fields on your way to market. Getting back afterwards it’s only 10-15 minutes on the train from either station back to Liverpool Street. 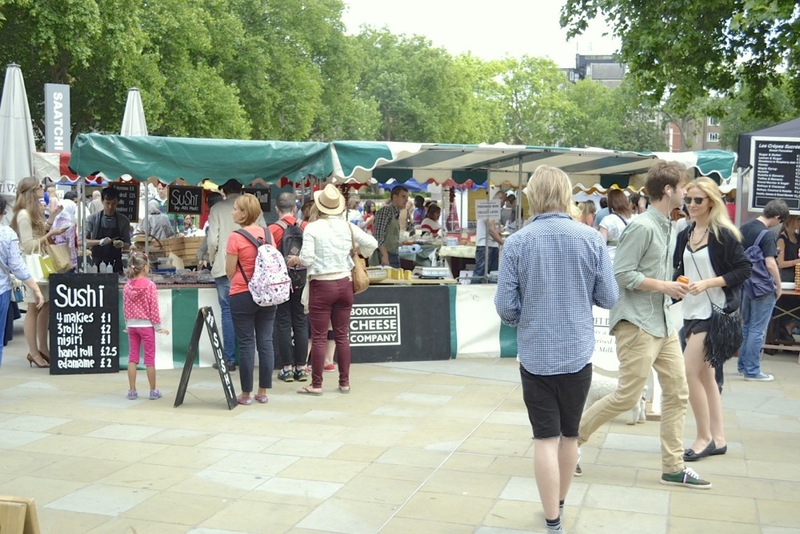 There’s a huge range of amazing stalls with lots of discoveries to be had at this market. Get some unique meats, a fresh array of cheeses, some organic vegetables and a heap of bread and cakes. 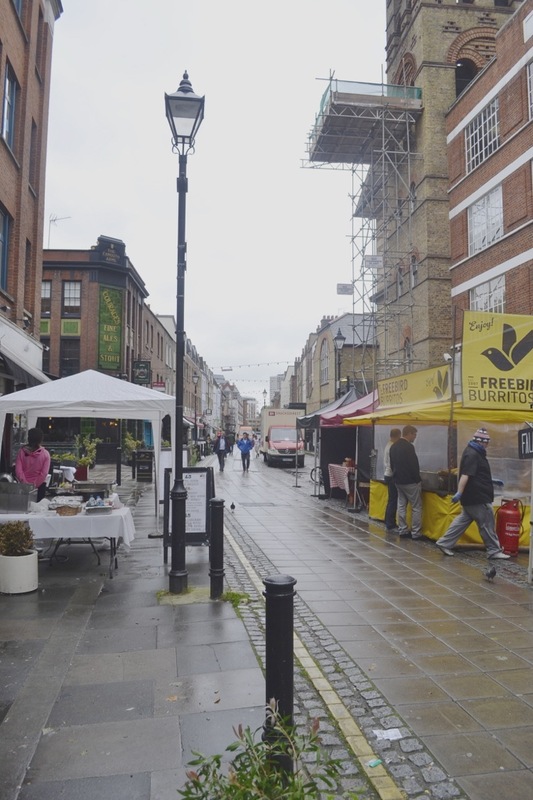 There are lots of little street food stalls dotted amongst the produce stalls, and, similar to Exmouth Market, there are design shops, cafés, salons, and restaurants dotted along either side of the street. There’s quite a few good bookshops and organic stores worth a visit. Broadway also has a few vintage threads traders and an old-fashioned eel and mash shop too. 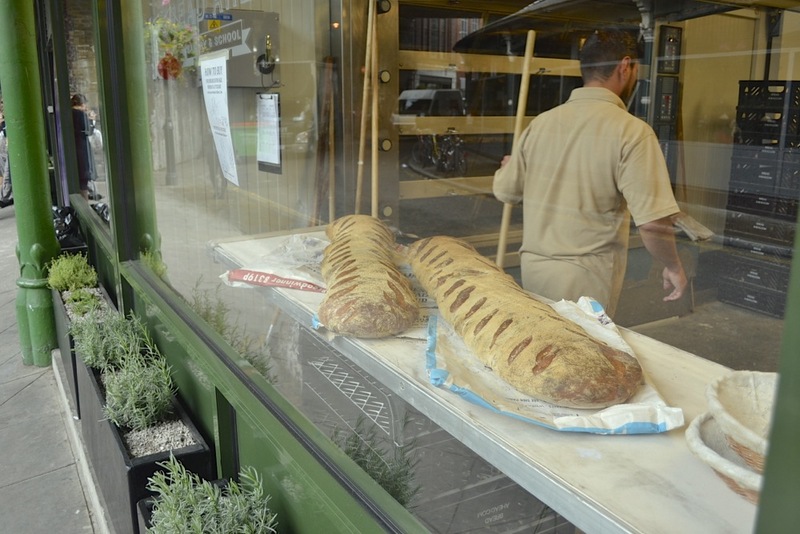 Nearby Netil Market is also well worth a visit too; two markets for the price of one! 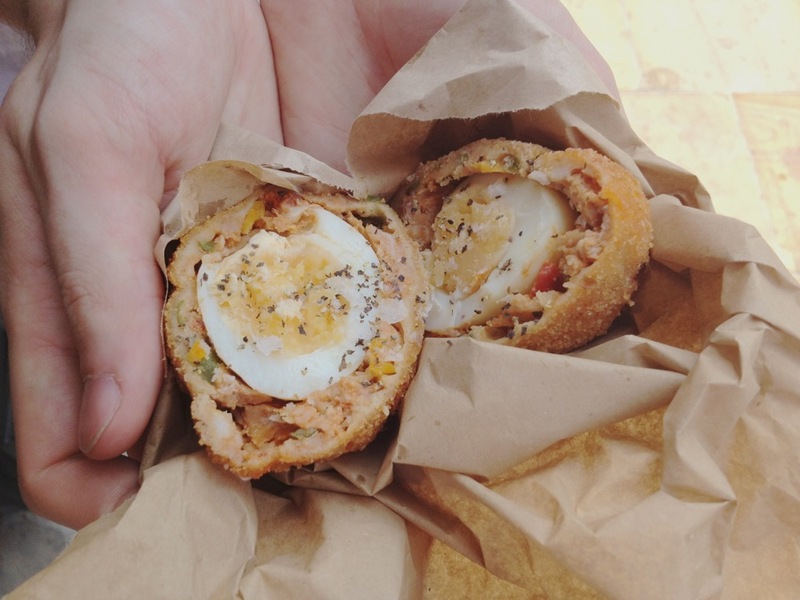 The scotch egg stall is well worth a try for some scotch eggs and pies, and we love what Fin and Flounder and the Spore Boys are doing at Broadway. London Fields is just up the road from the top of the market, while it’s also flanked by the Regent’s Canal on the other end. 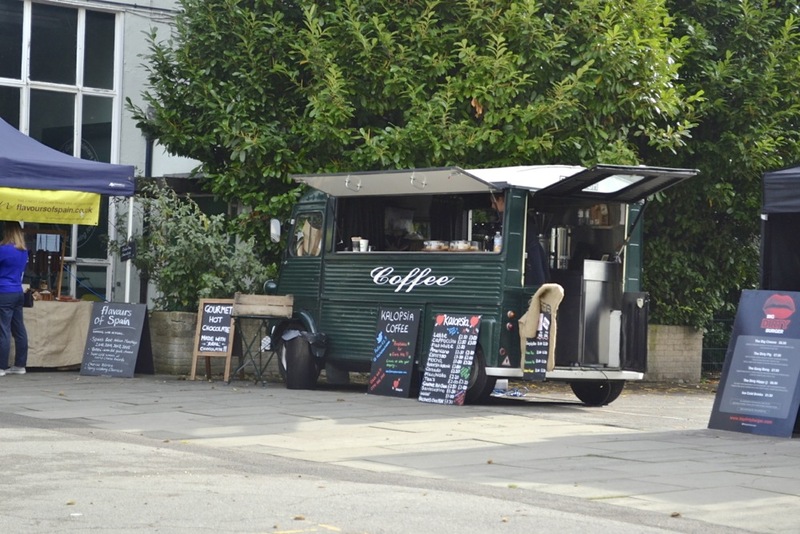 While away a nice afternoon with a stroll and a drink or coffee at one of the cafés, which spill out onto the street on busy days, or walk along the canal or through London Fields afterwards. 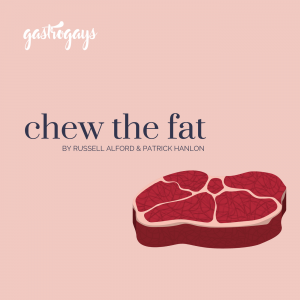 Catch up with them on Twitter or visit their website: http://www.broadwaymarket.co.uk/. It runs on Saturdays from 8:30am until 4pm-ish. For another market, you can’t go wrong by visiting the beautiful and floral Columbia Road Market, which is also nearby, on the same day and make a meal out of it all, even if only to get a taste of 1235 Donuts! One you may not have heard of, but you should know all about. 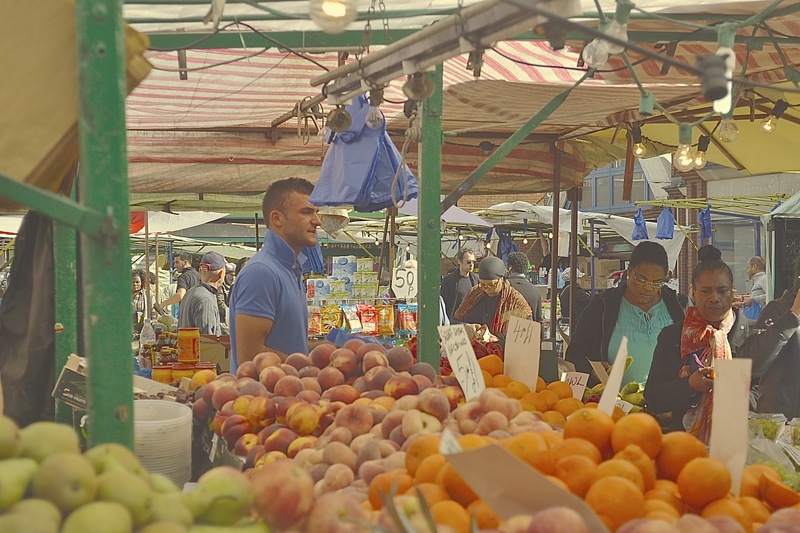 Right in the heart of Dalston is Ridley Road Market, which is chock-a-block with fresh fruit and veg and countless fresh meat and fish traders. If you live around here or not, it’s easily accessible via public transport. It’s one of those markets that’s worth popping in every few days to keep your kitchen stocked up with fresh stuff at some bargain prices. Beware though, when it’s hot or just warm out the wasps are ten a penny so if flying critters put you off buying, you may want to go elsewhere. There’s a lot of ethnic stalls and halal butchers dotted up and down the street, with the bulk of the fresh fruit and veg towards the beginning of the market at the High Street end. 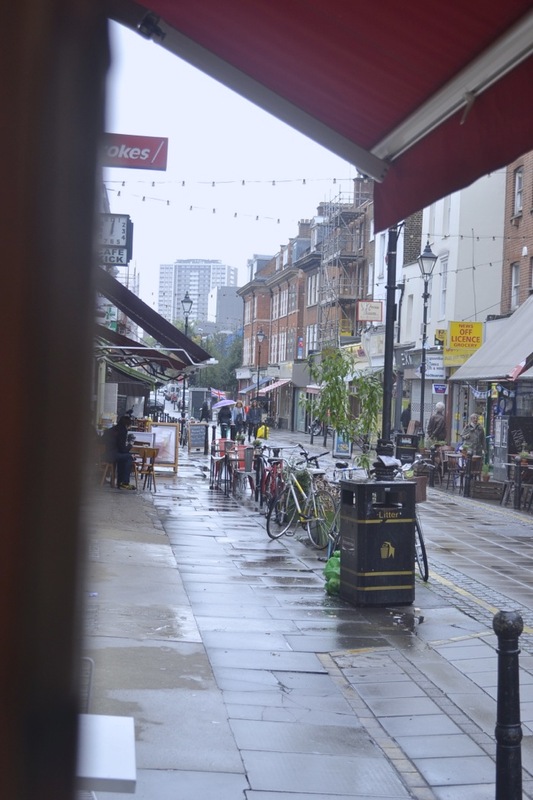 Ridley Road is directly across the road from Dalston Kingsland station (Overground). Another option is getting to Dalston Junction (also Overground, but a different line), it’s only a three minute walk around the corner. Open Monday to Saturday, 9-5pm. 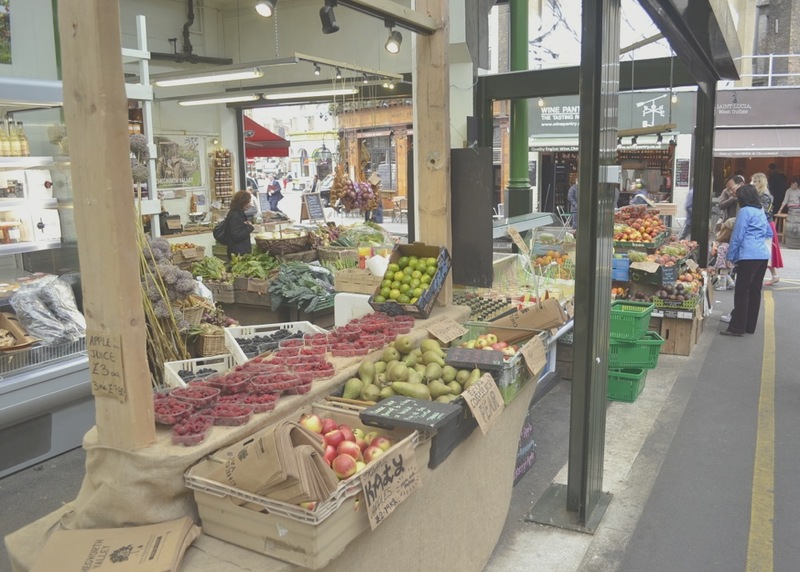 Located just off the fashionable King’s Road in Chelsea, Partridge’s Market is one of the best places to get top class produce, street food and special food items every Saturday in London, from 10am until 4pm. It’s located in Duke of York Square, which is just by the Saatchi Gallery and the closest tube stop is Sloane Square (Circle, District), but is also serviced by a number of bus routes to the tube station or the King’s Road. 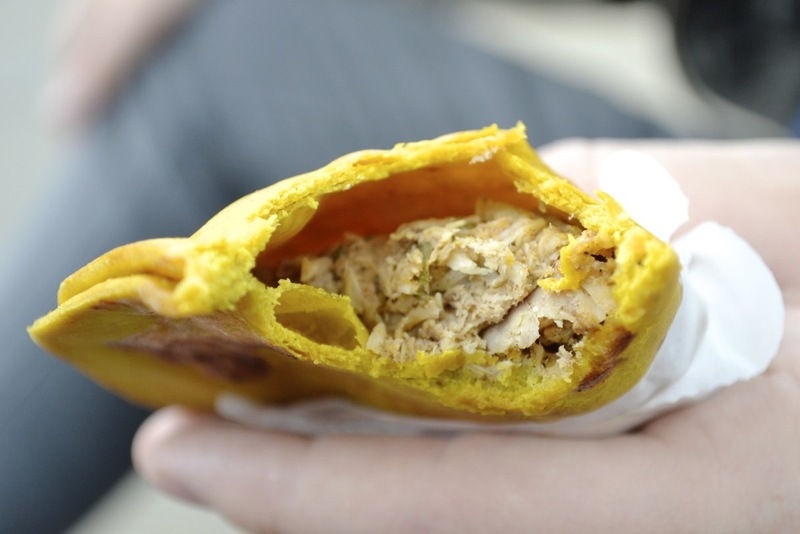 For eats, there are freshly made Caribbean and Asian stalls, as well as lots of baked goods and healthy lunches, alongside mega burgers, oysters and champagne, and falafel, plus lots of sitting space around the fountains. The staple of the square, Partridge’s speciality food store, is a bazaar of unique, international foods and speciality products for sale, with a deli, restaurant and fresh food counters all situated within too. One of our favourites, though we don’t manage to go that often as it’s the opposite side of the city to us, but always worth the trip to Chelsea and would be lovely if sight-seeing or shopping in central/west for the day. It’s offers a real down-to-earth vibe to the area, sitting alongside some uber fashionable and, if we may, pretentious boutiques and international fashion and beauty retailers. It’s refreshing, and has a lovely friendly, family atmosphere. Find them on Twitter and on their website. A little bit awkward to get to and only unfortunately only on briefly on a Saturday from 10am until 2pm, but this is a hidden treasure of a market, it is so beautiful and well-organised. Get to it by getting the train to St. Johns (from either Cannon Street or London Bridge, and the market is a mere two minutes from St. Johns station) or get the National Rail or DLR to Lewisham (though there’s a hill to walk up to get to the market from there). 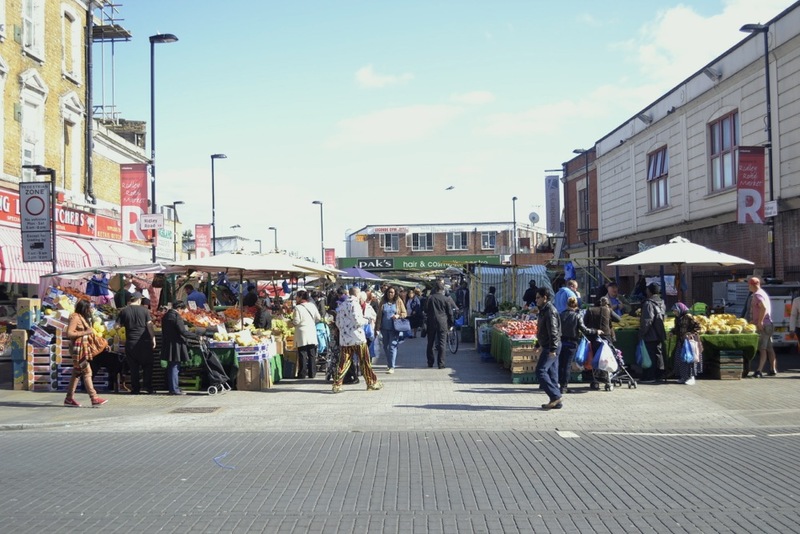 This market is located right beside Lewisham College and has such a great community atmosphere. Full of cheery and passionate food stall holders and street food suppliers, the only bad thing about this market is the short window of time during which it opens! Some traders duck in and out of weeks, but most are frequent, much-loved, static stalls. 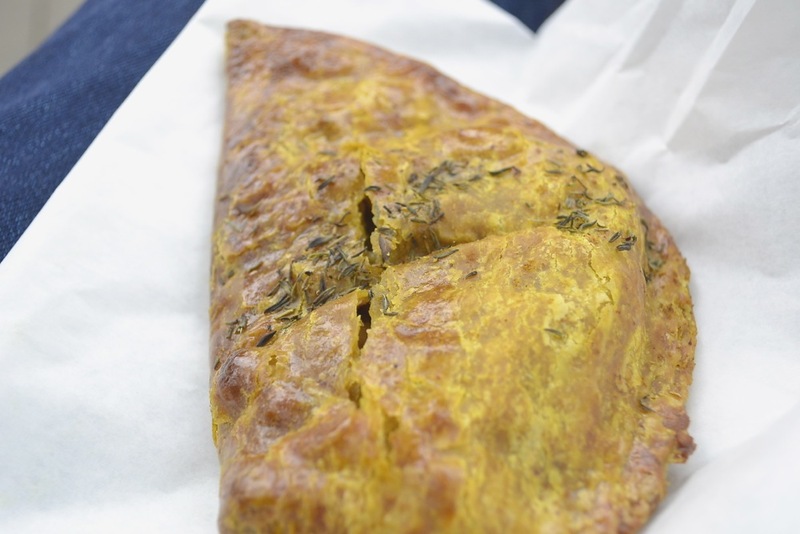 Grab some beautiful baked goods from KookyBakes, organic veggies from Wild Country Organics, special dairy and meat produce (Jacob’s Ladder), as well as some lovely, fresh, hot food on the spot. We’ve tried everything that’s hot on offer, from breakfast toasties to fresh, wood-fired piza, and fishdogs to buttermilk chicken, plus the coffee is excellent too. The market just gets more and more popular and in the nine months we’ve known it it’s been busier with each visit we take, so expect to queue for the hot food. There’s loads of space to walk around as the stalls are nicely spaced apart, and perfect for families (as well as doggies, which are always welcome and in abundance too). 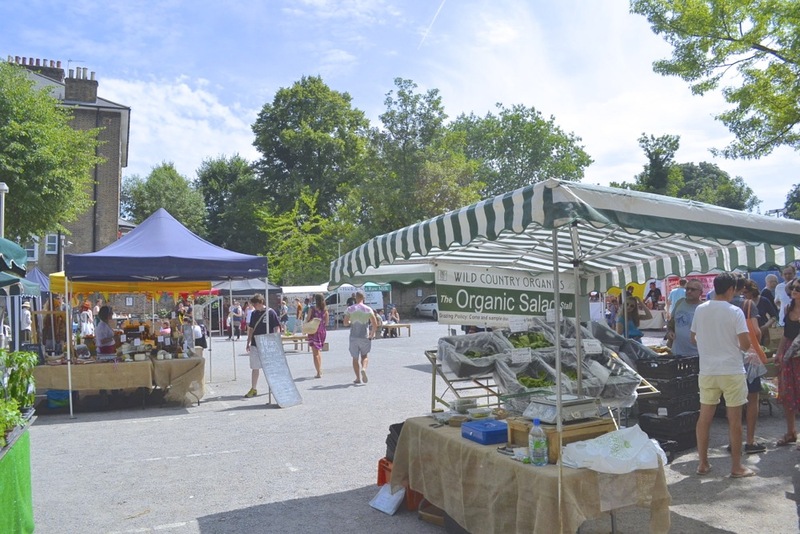 The market is small and has been operating just over two years, so show your support and give them a visit. 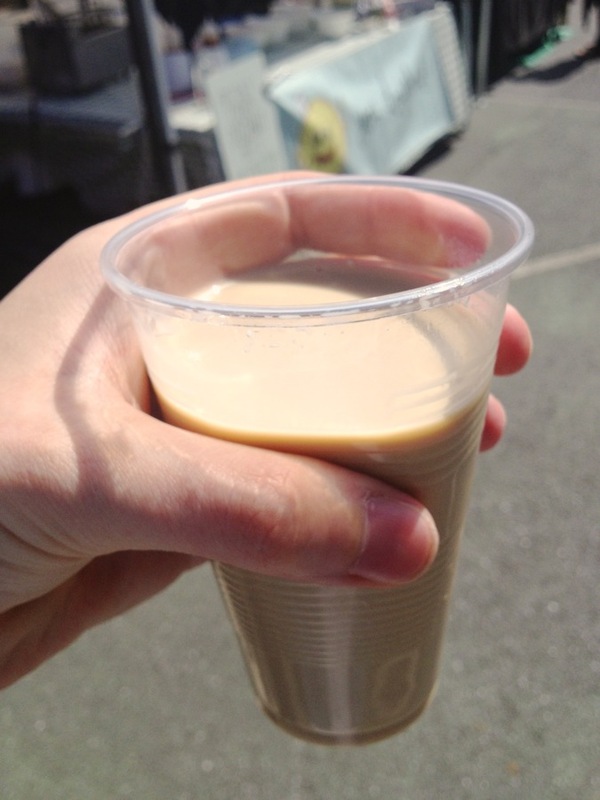 NOTE: Bring cash, there is no ATM available and the nearest corner shop with an ATM is a good 5-10 minute walk away. 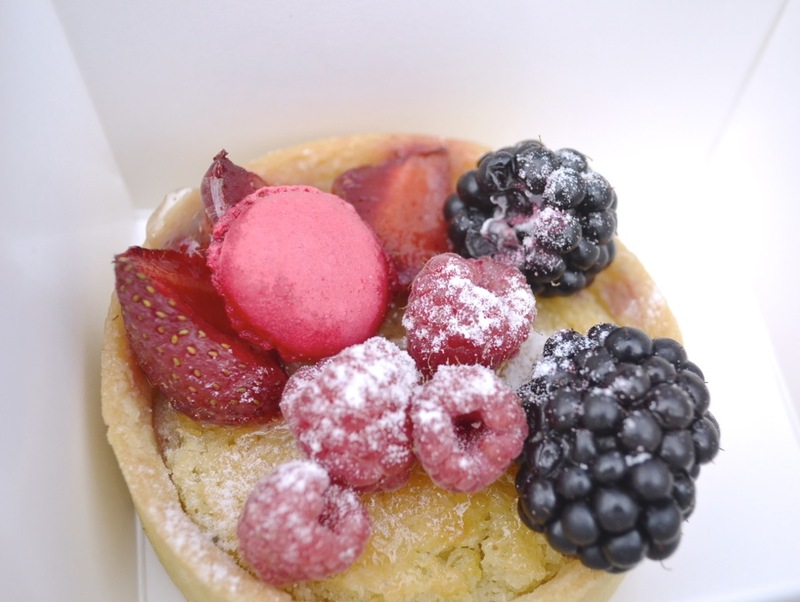 Find them on Twitter or visit their lovely website for info: http://www.brockleymarket.com/. 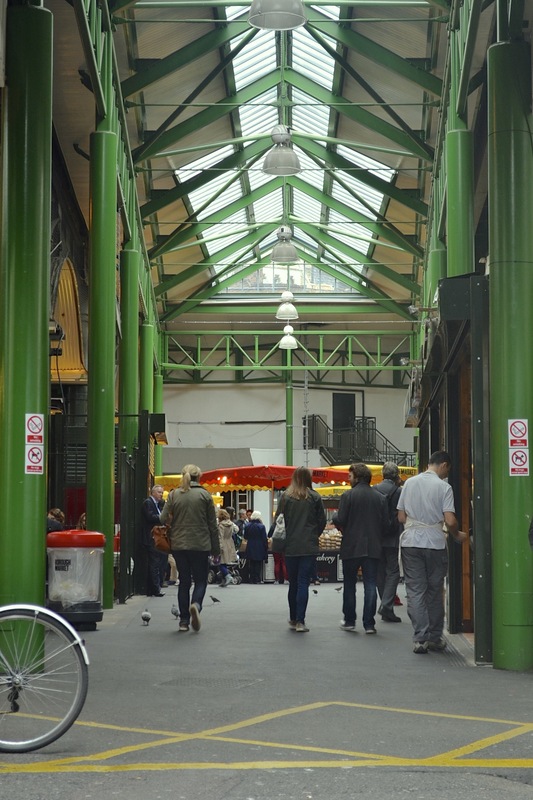 Located just off Tooley Street in the borough of Southwark, Maltby St. Market is a surprising little nook, located under the arches of a train bridge, which is frequently packed to the rafters with weekend wanderers and food market lovers. It’s best to get to by going to London Bridge (Jubilee, Northern) underground station and walking the 10 minutes to get there. Another alternative is to go to Bermondsey (Jubilee) tube station and walk/get the bus from there. 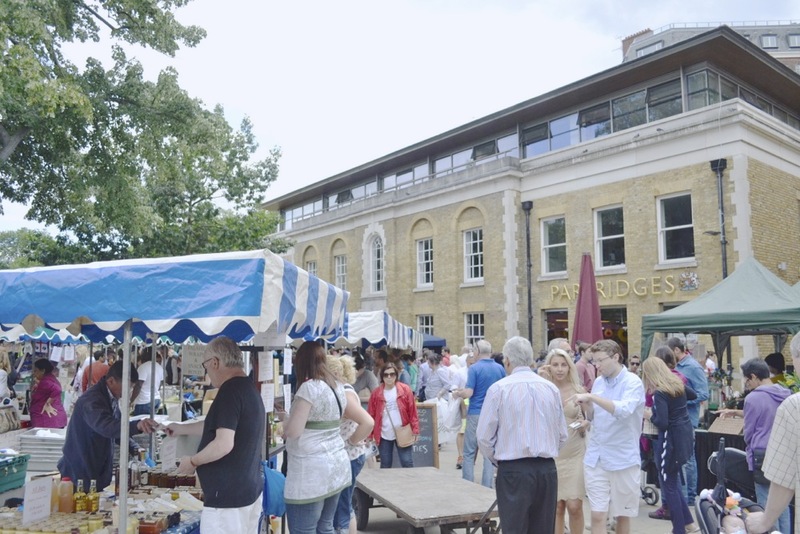 The long passage is home to many artisan stalls selling hot and cold food, juices, drinks and meat and veg of a truly high standard. The bridge archways are home to many little restaurants and pop-ups – which are usually jam-packed with groups of friends or families on a busy Saturday afternoon. Doggies welcome, and worth a trip – there’s a great bakery towards the end of the walkway. 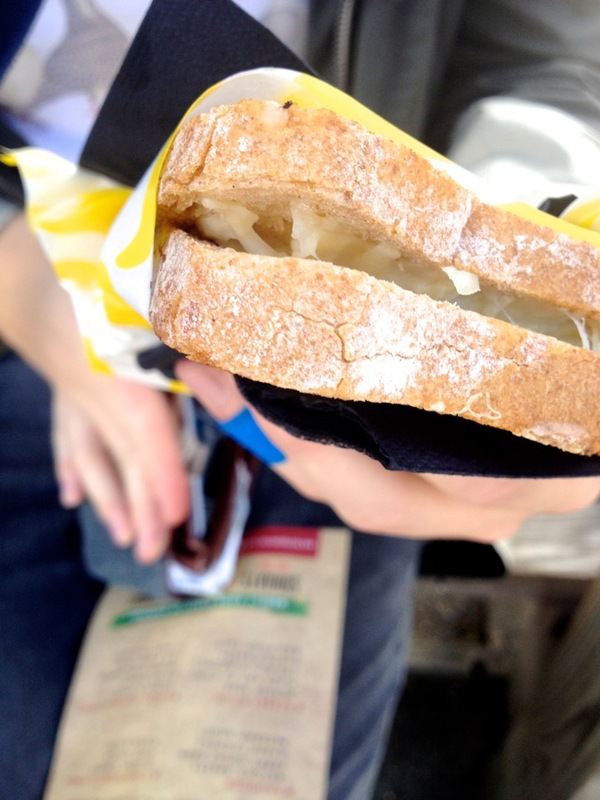 Visit the website for information: http://www.maltby.st/ and the market is also on Twitter. A very nice spread along the exceptionally lengthy Portobello Road. Lots of people come for the antiques, but it’s also really reliable for vintage clothes and food too. Hop on the tube to Ladbroke Grove (Hammersmith, Circle, District) and the market is about a three minute walk two streets over, you can’t miss it as you will likely land smack bang in the middle of it all. It keeps quite quiet, though worthy of a look, on weekdays but Fridays and Saturdays are the days to go. You will find the antiques up the far end of the market, around all the dedicated and celebrated shops, with lots of trinkets and pre-loved pieces – all packing a punchy price tag too, mind! In the middle you will find a long expanse of fresh produce stalls. From your usual fruit and veg to specialist meat and dairy. There’s lots of great independent producer stalls with the likes of jams, pasta, olives, mushrooms, cheeses etc. and some bargain flowers/herbs too. Further up the opposite end of the market is exclusively dedicated to some really great quality vintage clothes, shoes and jewellery. Monday, Tuesday, Wednesday, Friday and Saturday it kicks off early, from 8am ’til 6pm. Thursday is a half day, closed on Sunday. This is one of our favourites and probably the first that stole our hearts on many a trip to London. We’ve happily eaten here three evenings in a row during a given week as the quality and choice is exceptional, even for a market of medium size like this. 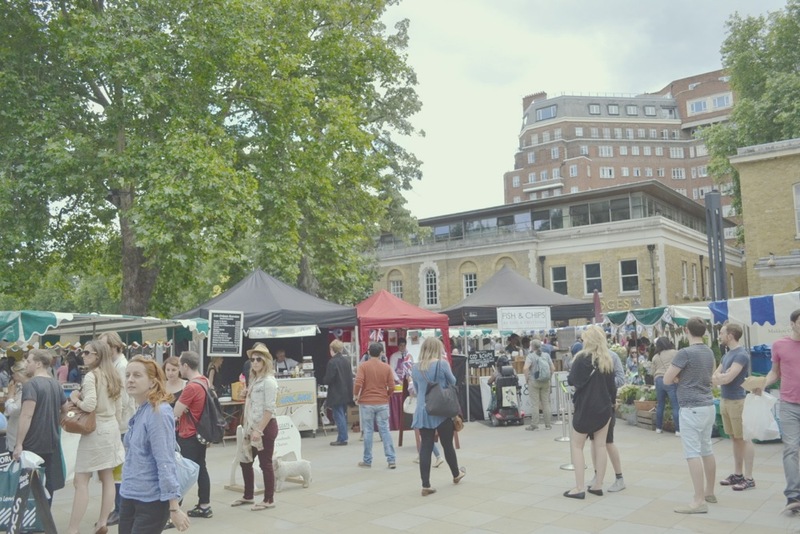 The Southbank is a well-organised, expertly managed market which is housed in a nook of the Southbank, just a street back from the Thames. The organisers pride themselves on the mantra and belief that convenience meals and easy access dishes don’t have to be sub par or from cheap standards. 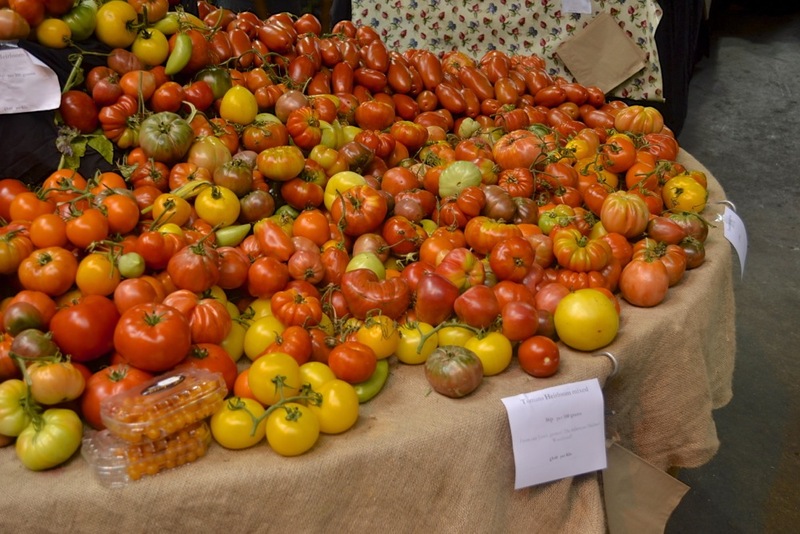 They champion organic and British producers, as well providing international fare. 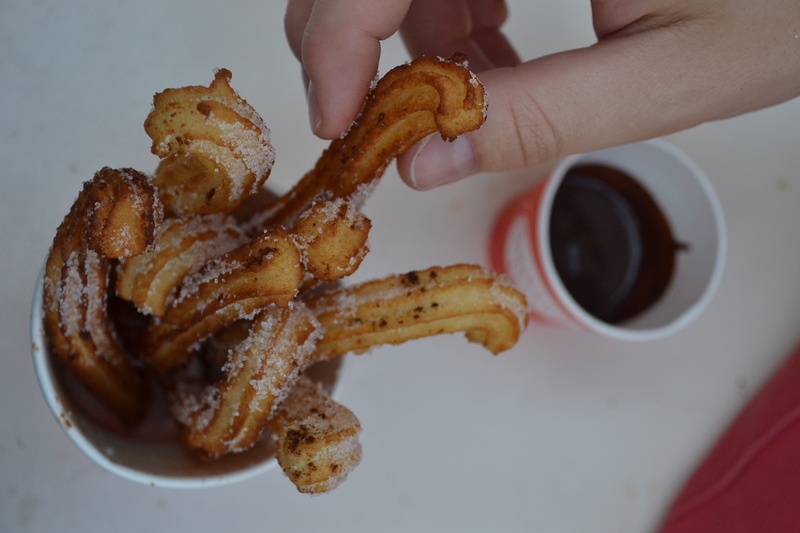 We’ve had Indian dosa pancakes, the BEST churros in London, Italian affogato, organic cider and wine, French moules frites… there really is something great worth trying every single time you visit. The duck confit burger and the bruschetta are also stars of the market. Friday and Saturday are busiest, opening 12-8pm on Friday and 11-8pm Saturday, followed by a short 12-6pm stint on Sundays. Check out their website here for all the info you need: http://www.realfoodfestival.co.uk/market. 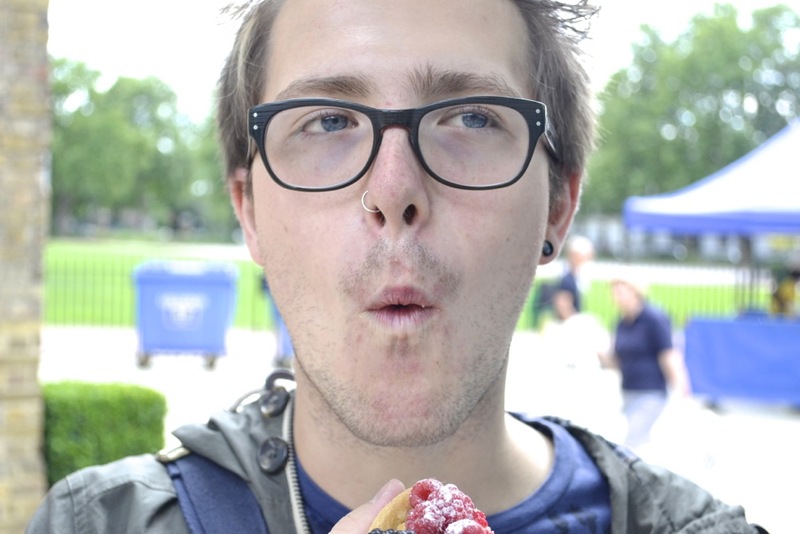 They are on the tweetbox too, @RealFoodFest. The easiest stations to use are Waterloo (National Rail, Jubilee, Northern, Bakerloo, Waterloo & City) and Embankment (Circle, District). From either, it’s a short five minute walk. This market seems a little hidden and off the beaten track, and is flanked by a couple of amazing vintage/antique shops. This is located on a large road, of the same name, which is closed off on Sundays to allow for this special market to take place between 11am and 4pm. The original, huge market ran for 60 years until being closed in the Nineties. Thankfully, after much campaigning, the market returned in 2010 and has been a weekly, permanent fixture now for two years. The easiest way to get there is by Overground to Homerton station, or you can get the National Rail trains to either Clapton or Hackney Central. Any which way it will incur a short walk to get to the market, but Chatsworth Rd. is also serviced by quite a few bus routes too. 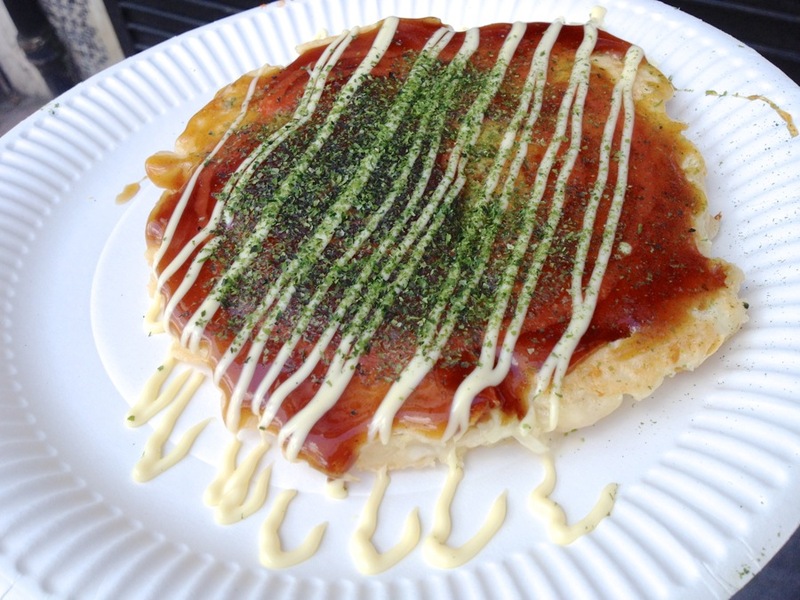 We love the Shofoodoh stand to pick up these Japanese potato cake/pancakes called okonomayaki. The times we have gone it’s been a little quiet or towards the end of the trading day, so here is a list of the stall traders, be sure to check out the full website: http://www.chatsworthroade5.co.uk/market/. Talk to ’em on Twitter too, where they are very active. Some great antique, vintage and charity shops dotted around the street, as well as some beautiful little cafés too. Shout out to London Borough of Jam store, which is a must-visit! A long and large market street, commonly held as the oldest market route in London, which is quite easily accessible by the tube stops at Bethnal Green (Central), Mile End (Central, Circle, District, Hammersmith) or Bow Road (Circle, District, Hammersmith), though a bus will take you direct to Roman Road’s entrance. For us, a combination of tube then bus worked a treat. 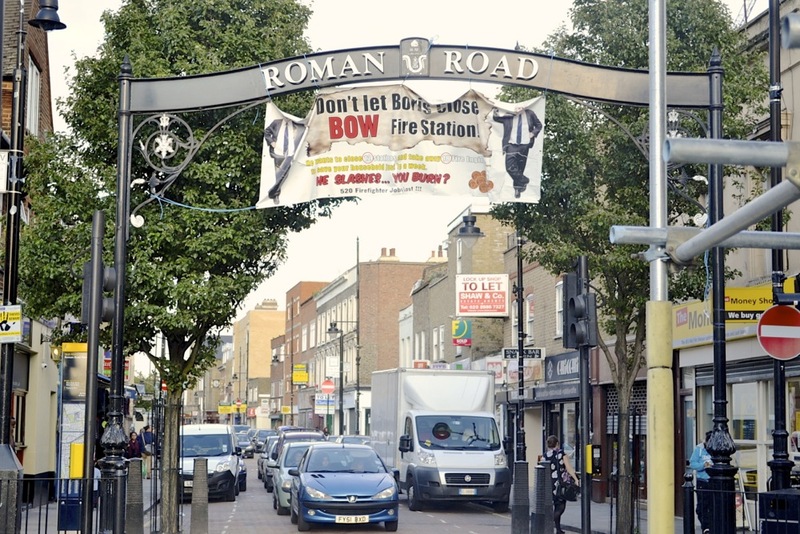 Roman Road is busiest on a Saturday afternoon, where it is packed with fashion stalls, knick knacks, homewares and some produce stalls. There’s not a whole lot else for the discernable foodie or market forager. Some brilliant antiques shops, charity shops and cool cafés also populate the Roman Road. People may remember Mary Portas was involved with breathing new life into the market last year for her Queen of Shops series. Quite a small market wedged just off the Islington Upper Road and a stone’s throw from the Angel tube station (Northern). 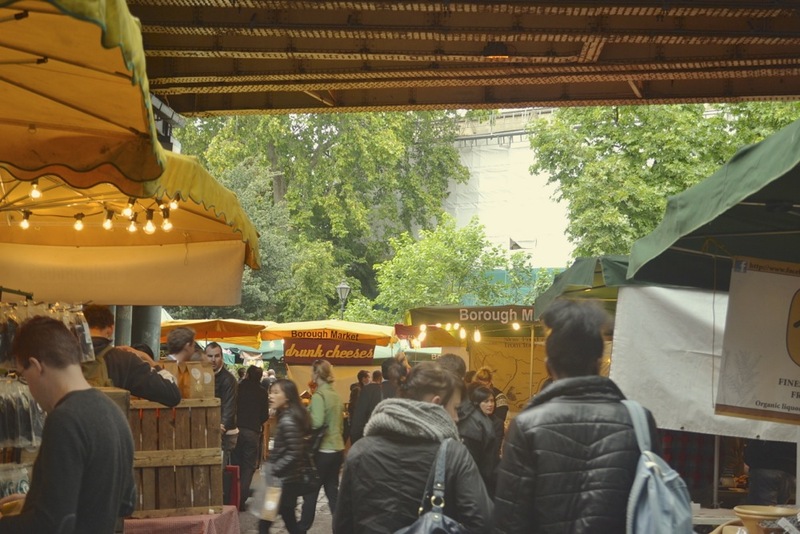 There’s a few little artisan produce stalls and small food trucks serving some international street food, as well as the usual few fresh veg/fruit stalls, electronics and clothes stalls. Try the French cheese stand near the front and try the Tartiflette with side salad for an amazing £4.50. Tartiflette is made from potatoes, onions and bacon lardons which is collectively smothered in reblochon cheese. There’s a medium-sized, new shopping centre just across the road with a cinema, restaurants and a few high street shops, as well as the Islington Academy live venue. Open six days a week, closed on Mondays. Tuesday to Saturday 9am-6pm, Sundays 8.30am-4pm. Cross the road at Angel Station exit and walk thirty seconds up Liverpool Road. 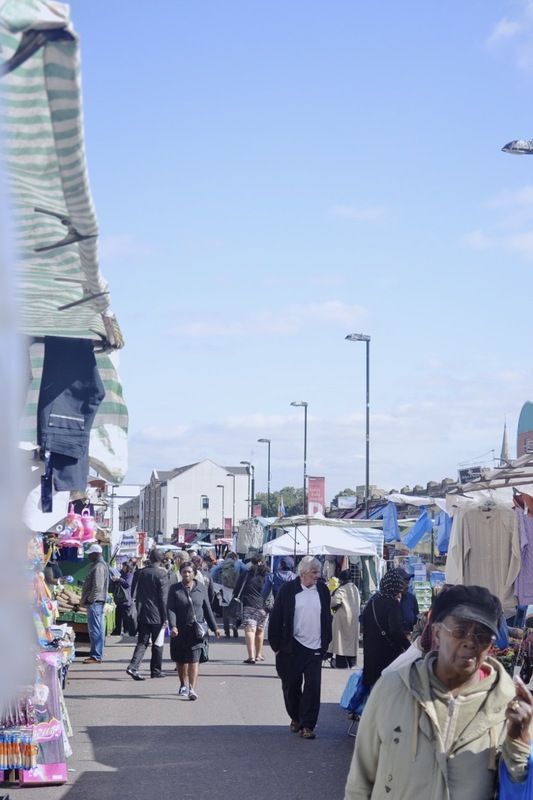 Touted as Europe’s largest outdoor street market, this goes along the entire length of Walthamstow High Road and begins beside the Town Square and The Walthamstow Mall. You can get the Overground and get off at Walthamstow Queen’s Road (which a short walk will bring you right into the middle of the market) or get off at the Walthamstow Central station (National Rail, Victoria). 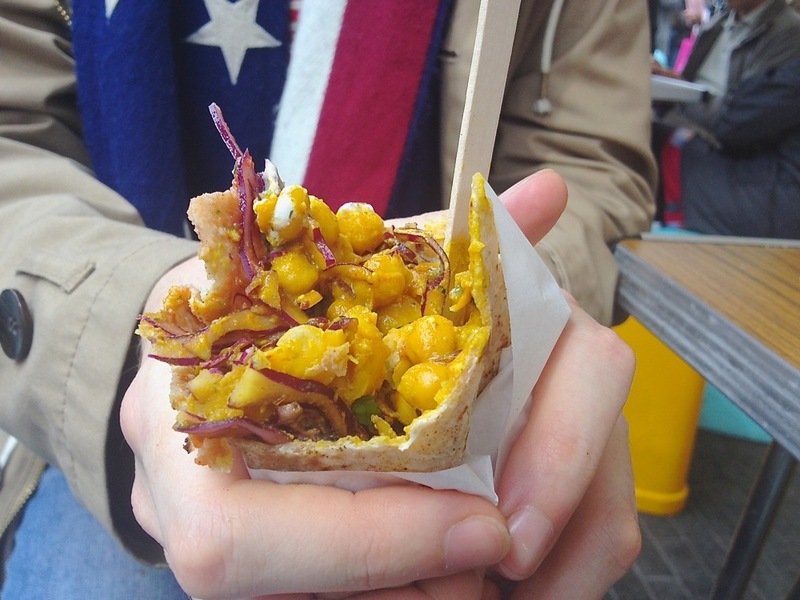 Lick your lips and move your hips to these lunchtime and evening time markets, where eating off the street is fundamental! Some seasoned travellers or fellow Londoners may notice a few lacking from the above, and well done if you got any of these below at home. 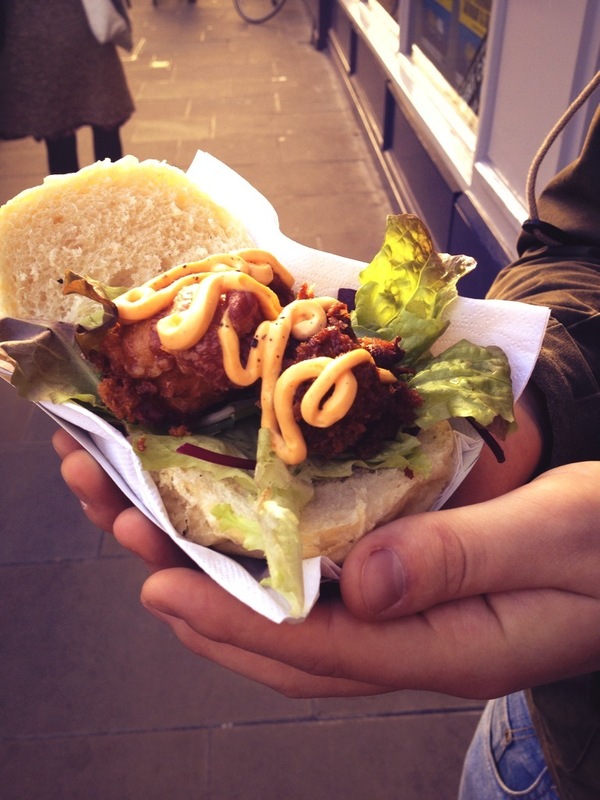 If you want street food specific look no further than Street Feast and KERB. 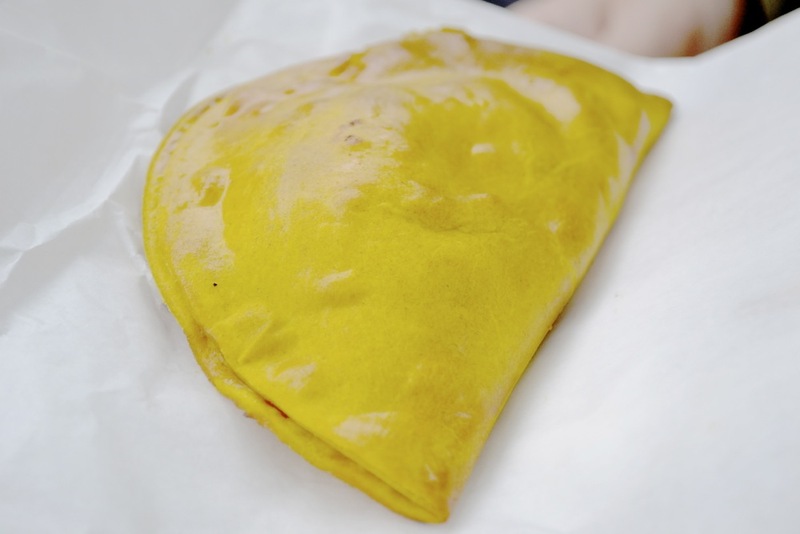 Both are killing it in the street food/food truck game, with KERB dominating the scene for the past few years in a number of guises – most notably at the Gherkin and King’s Cross locations. Street Feast, the newcomer, is biting on the ankles of the former after its insanely popular and mesmirising residency in Dalston Kingsland (Overground) this summer. It then moved location for the past few months to Hawker House, just off Broadway Market. Though again it’s taken a break, we foresee it sticking around for the future and popping up for years to come. Then, you have also got your Brick Lane and Brixton Market businesses. 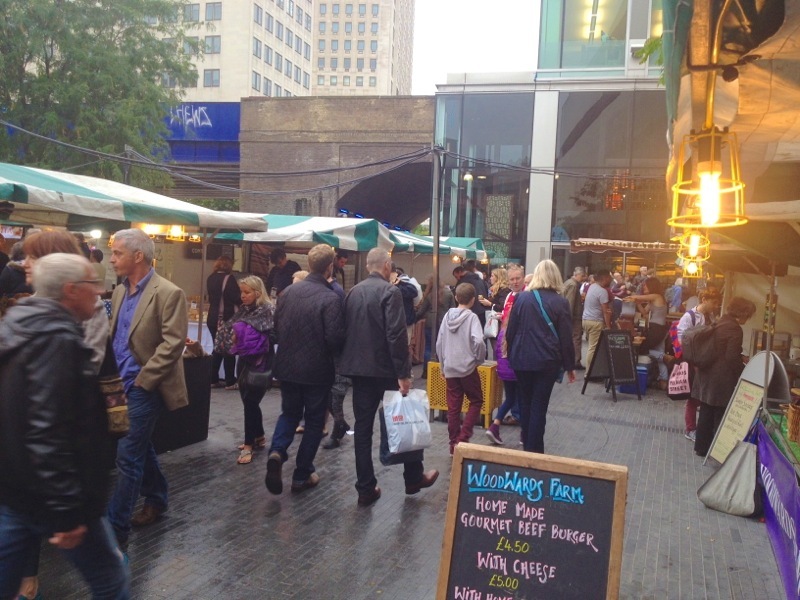 A healthy mix of stalls, static restaurants, pop-ups, street food and cafés in both. Hop on the Victoria line and Brixton is the final station for the market there, which is then a five minute walk around the corner and back past the station. It’s split into the bigger Arcade and the smaller Market Row across the road. 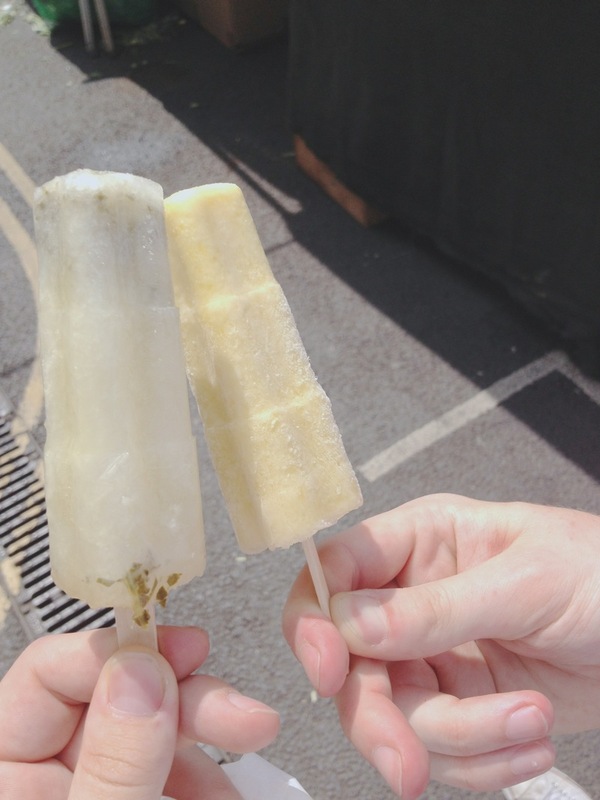 We love The Joint and Wishbone, which we reviewed, as well as the ice-cream stall and the Cornercopia. 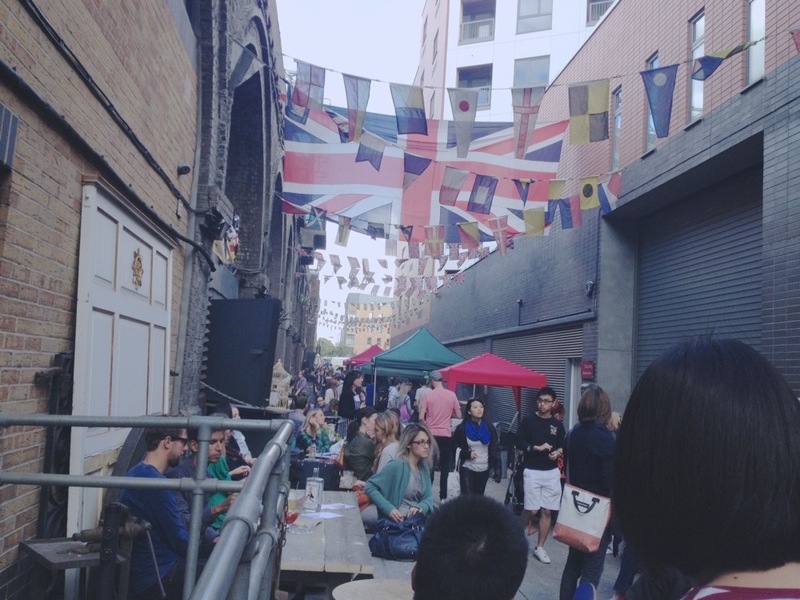 Head to Shoreditch High Street (Overground) or Liverpool Street (Central, Circle, Hammersmith, Met, National Rail) to get to the eateries of Brick Lane, where it’s completely international and few cultures are left out or palettes unattended to. Some of the best curries in the city are to be found along this fashionable stretch, as well as some top notch beigel shops. 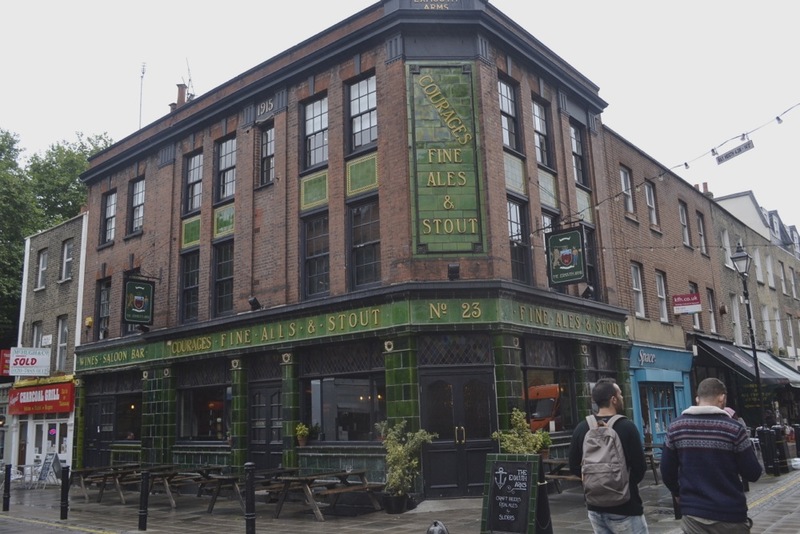 A visit to Spitalfields and Rough Trade are also of utmost importance for any trip to this area, plus head to the nearby Commercial Tavern for a quirky little drink. One of the oldest markets, and maybe the most central, is the Berwick Street market in Soho. Down quite a small street, it’s now morphed into quite a squashed market which specialises in street food – get to it by going to either Piccadilly Circus (Bakerloo, Piccadilly) or Oxford Circus (Bakerloo, Central, Victoria) – ain’t nothin’ but a five minute walk from either. Don’t let the location or the look fool you, there’s some gems here! Shout out to the Bratwurst stall! 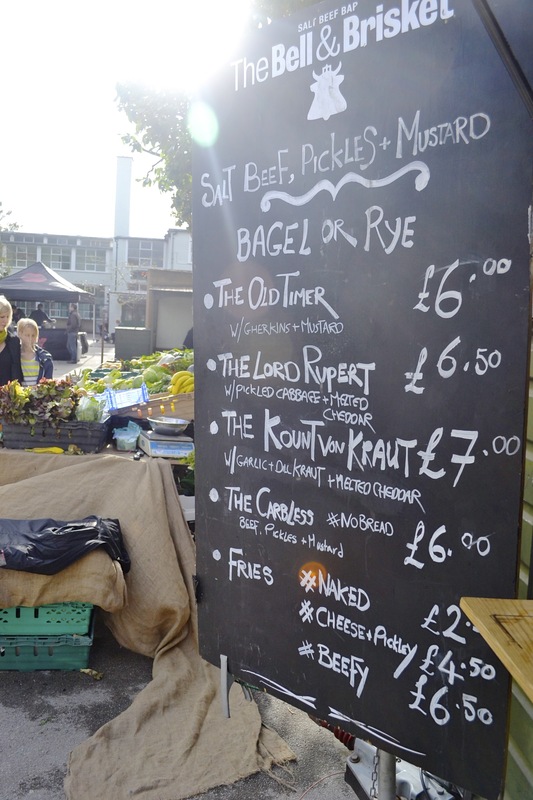 New/up-and-coming markets to watch out for over the next few months include Herne Hill Market, Wapping Market, Netil Market…. 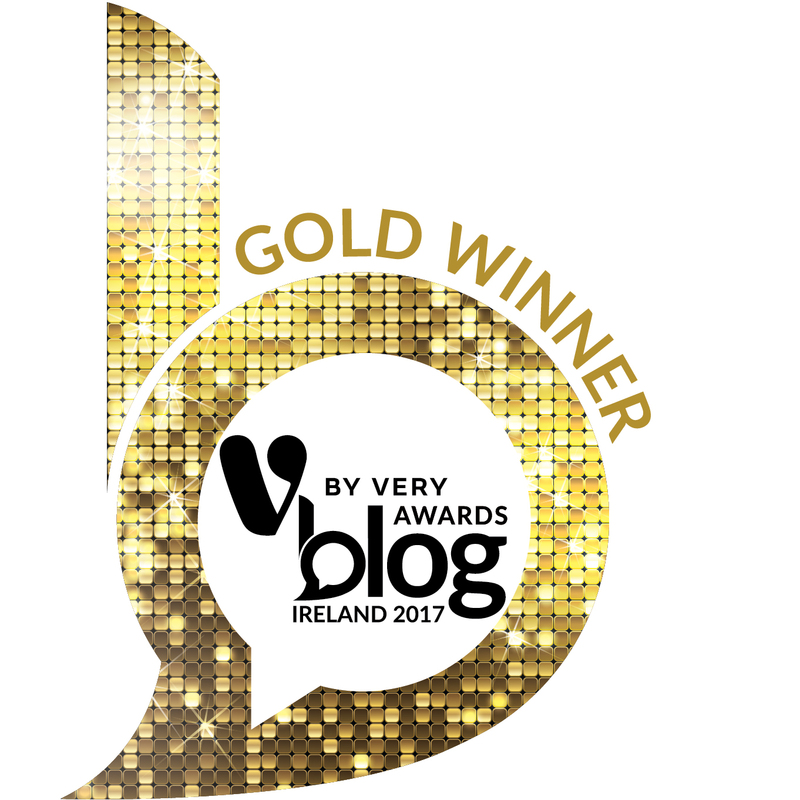 So that’s our round-up. We will add to this constantly as markets chop and change and as we visit more and more of them, especially in the suburbs. Let us know if you use this guide or your own thoughts on the markets above. If there is a market you feel we should know about, drop us an email! – Russell & Patrick.